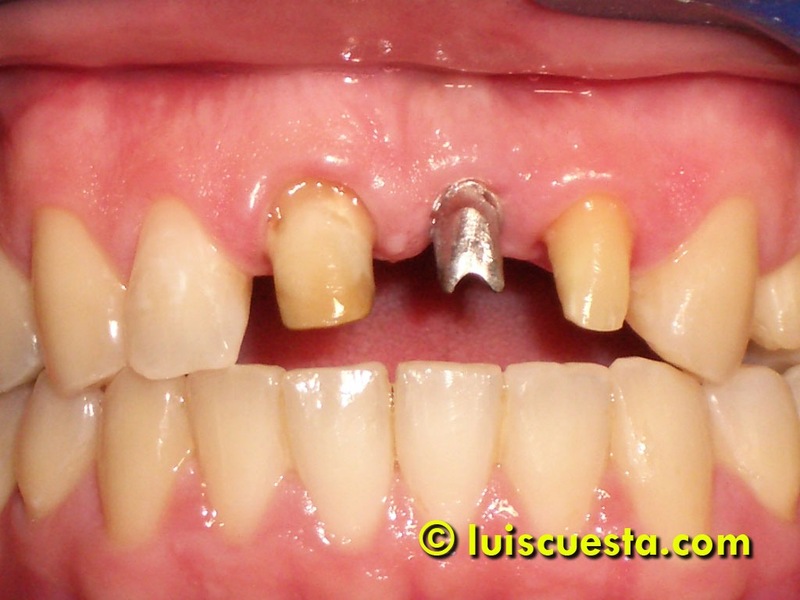 Mesial tipping behind an extraction site is a normal phenomenon that can be corrected using a simple acrylic wedge and some patience, from both patient and dentist. 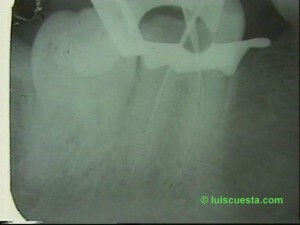 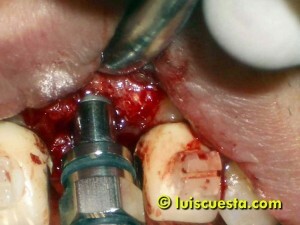 Here I show how to distalize a tooth in order to correct the mesial tipping without using orthodontics. 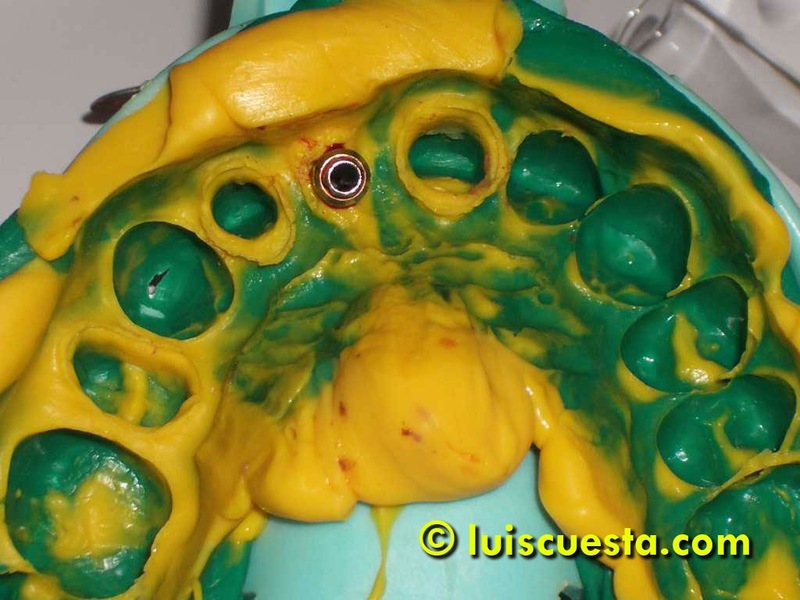 First make your design and explain it to the patient and to your dental technician. 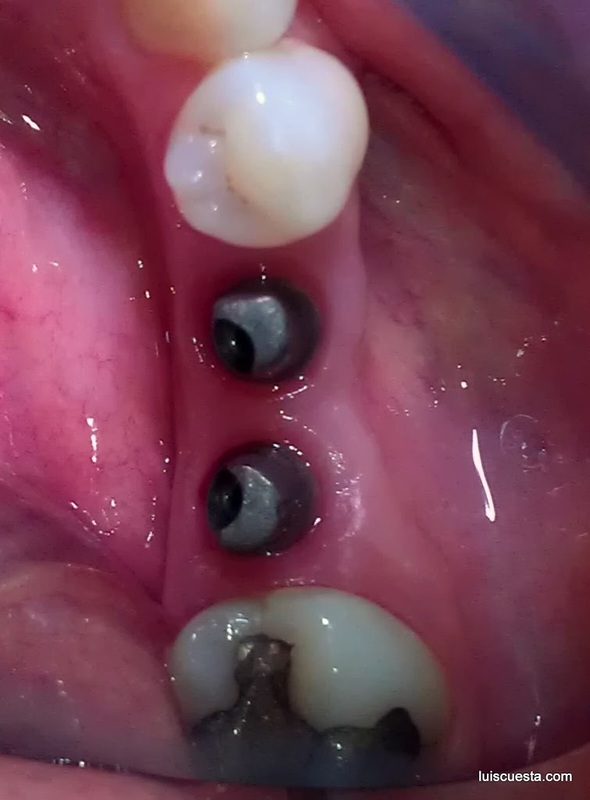 The goal in this case was to fit a longer disto-mesial crown on the back implant that tilts the second molar back to a more upright angle. 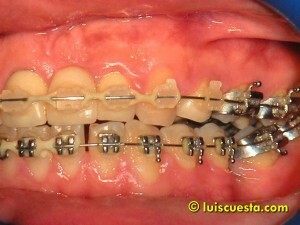 Notice that is is reciprocal. 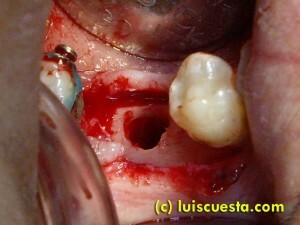 The crown won’t fit in the place unless the gap is made somehow bigger before the insertion. 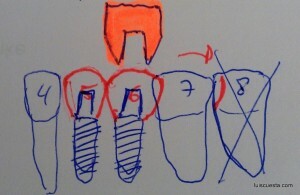 For that we need a simple aid. 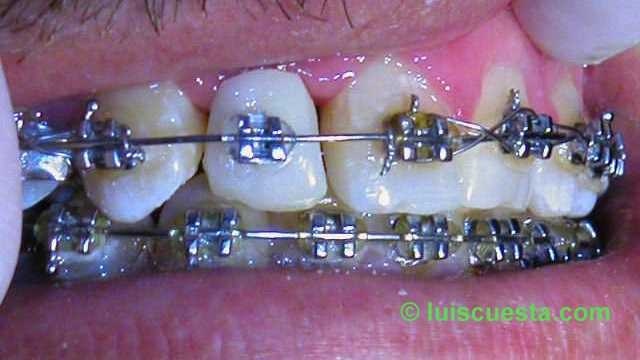 That is, for example, a chairside made acrylic wedge that you make over the future crown abutments on the cast model or directly in the mouth. It can also be done in the lab, if you prefer. This is more precise, but it requires a second impression and thus, more time. 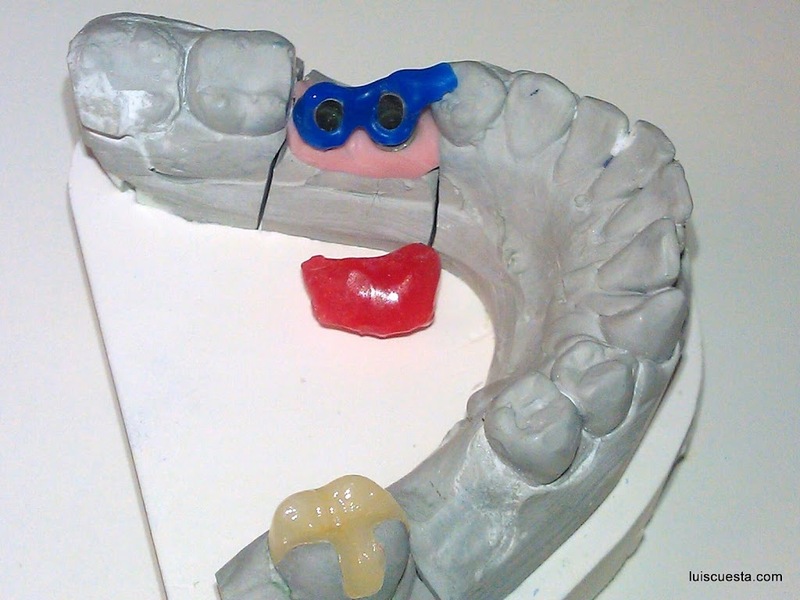 You take some cast material from the mesial side of the tooth to be tipped back, then you build the acrylic wedge on the model. 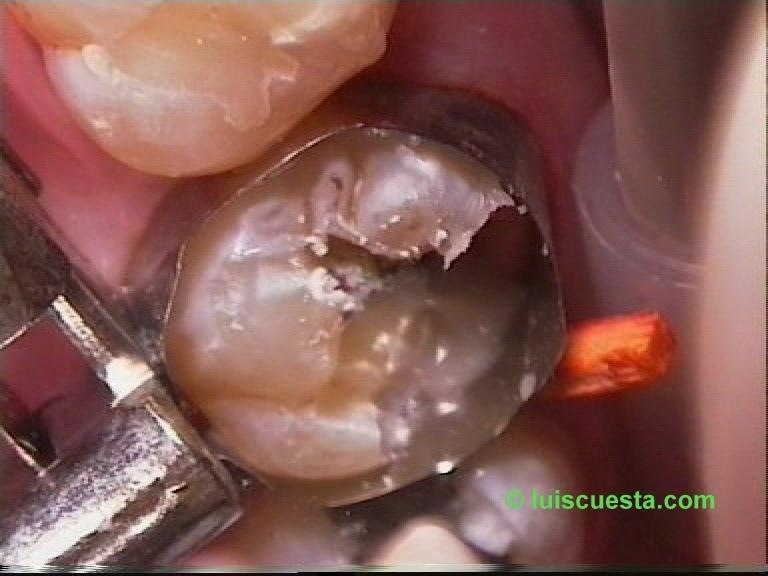 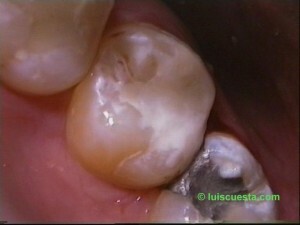 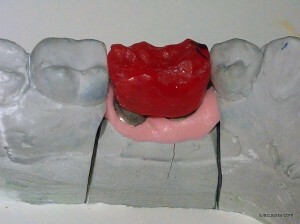 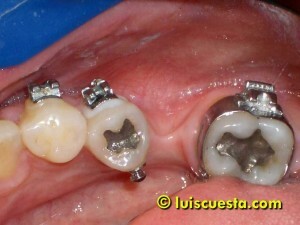 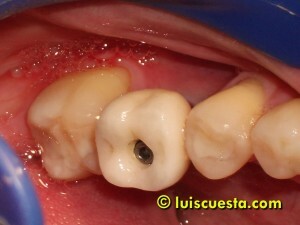 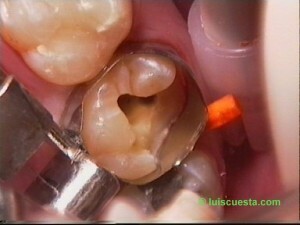 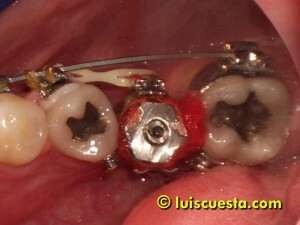 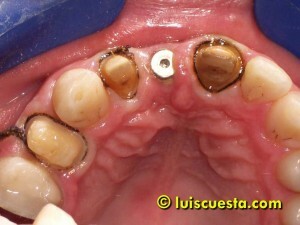 This allows to prepare the final crown and to have it ready as soon as the molar tips back and lets the crown in. 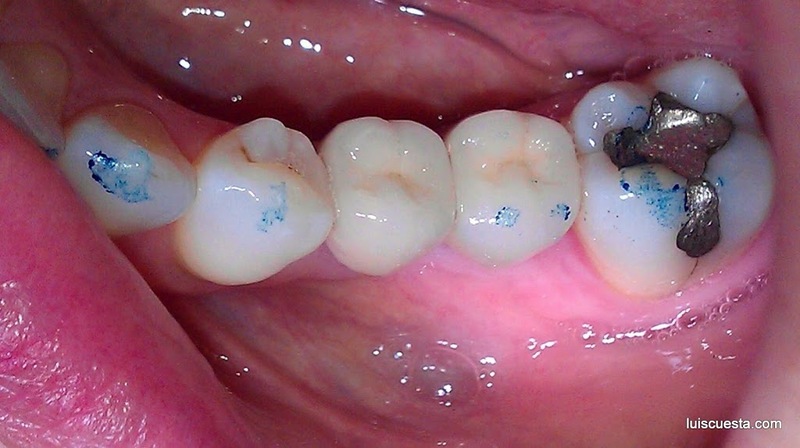 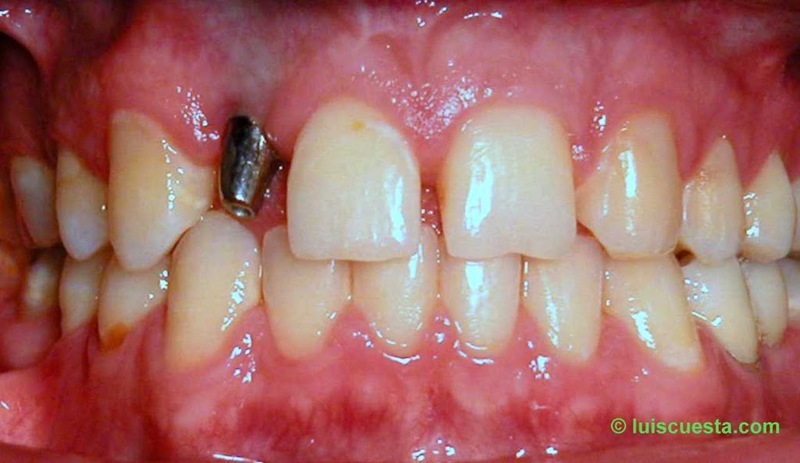 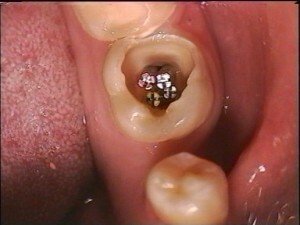 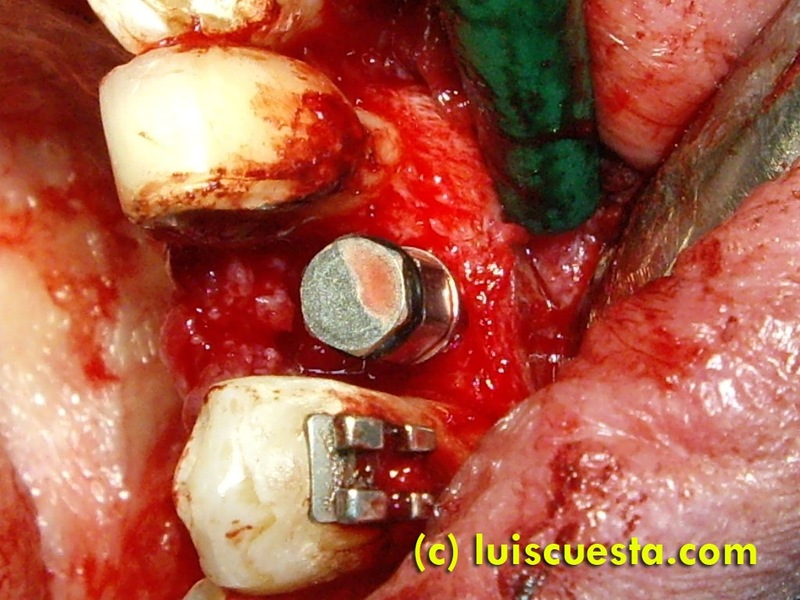 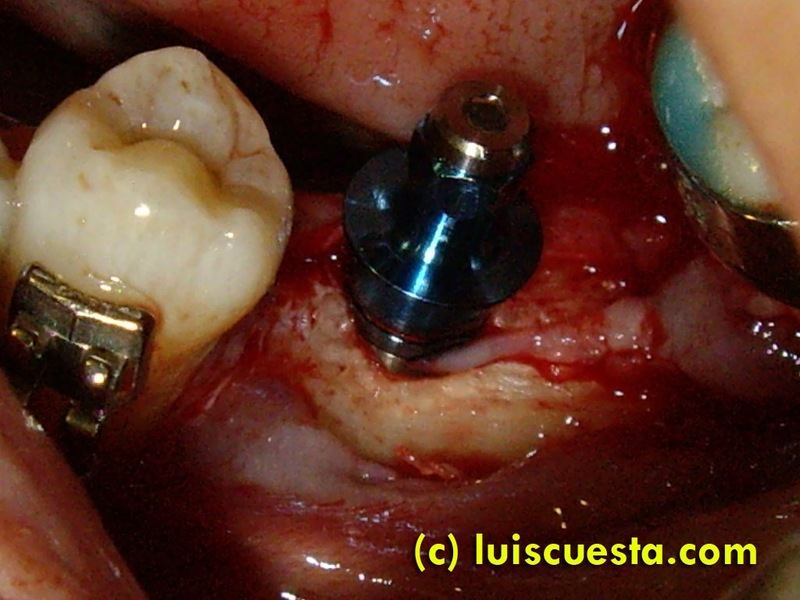 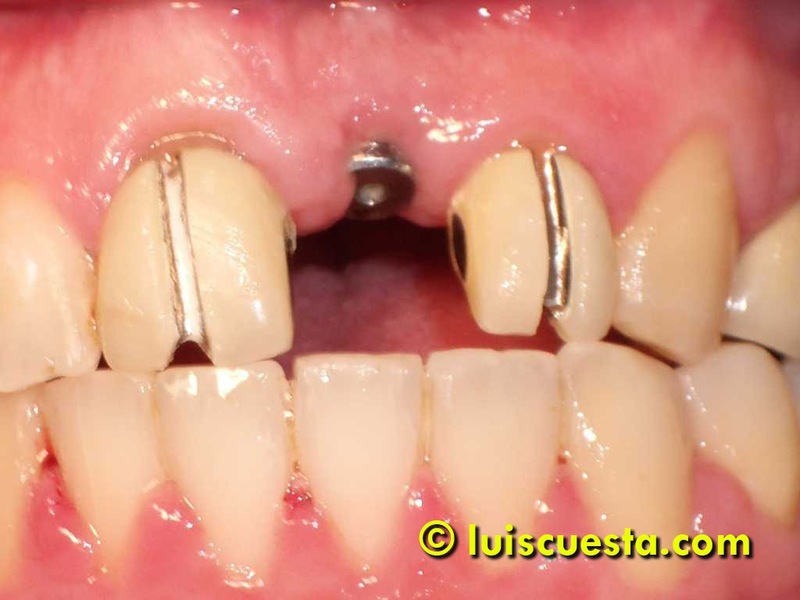 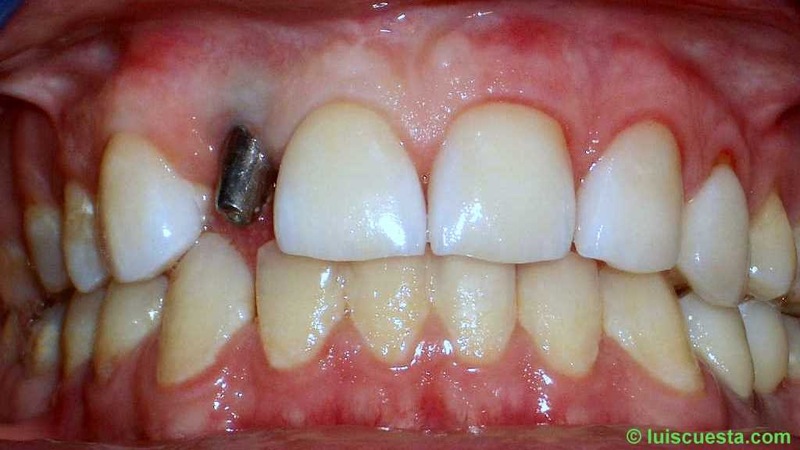 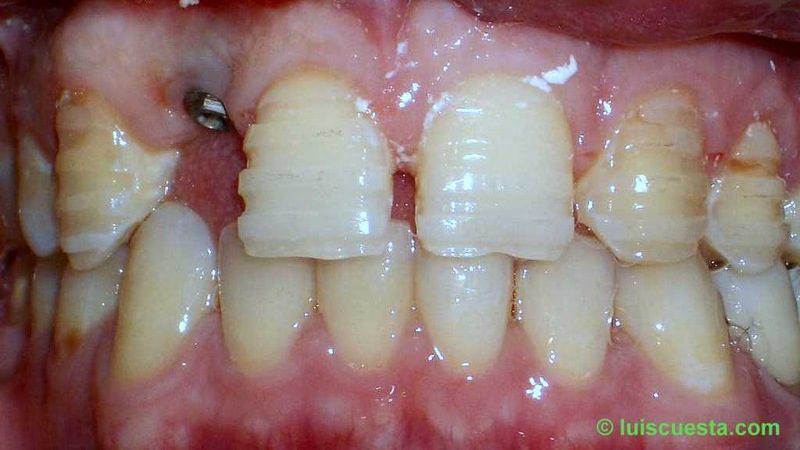 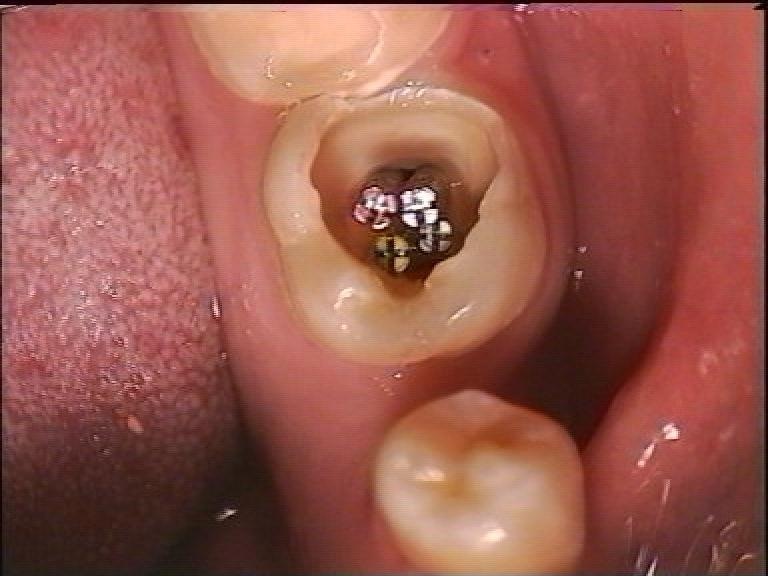 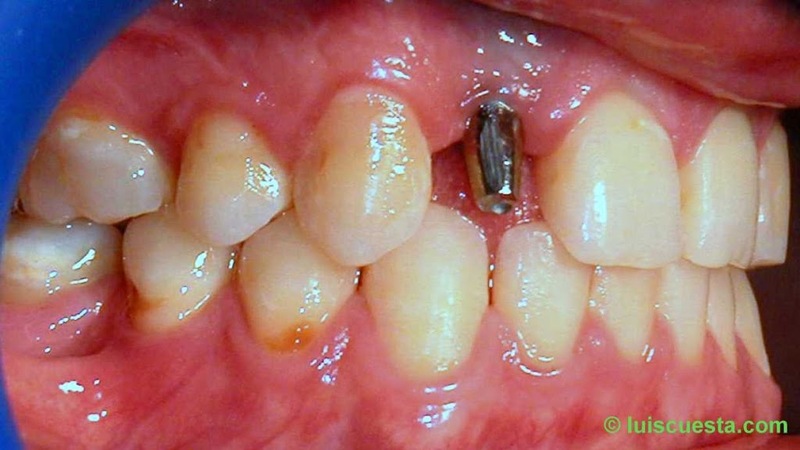 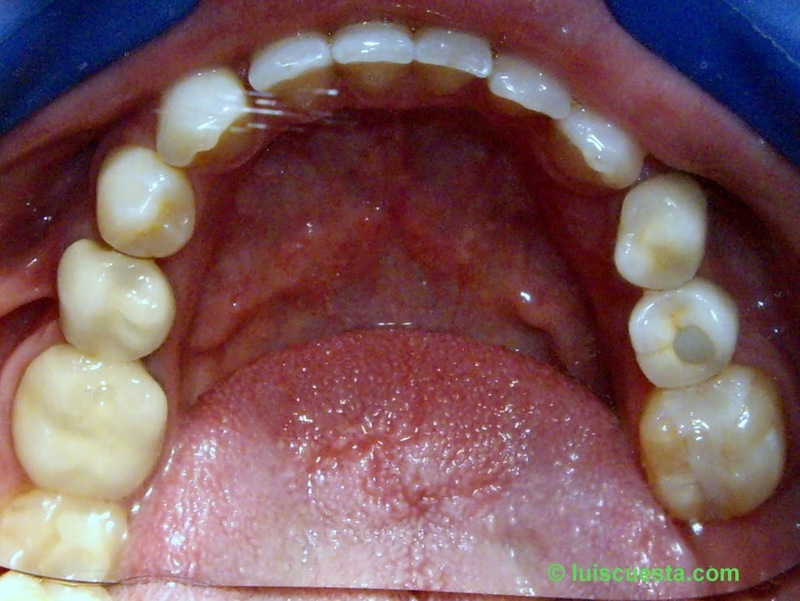 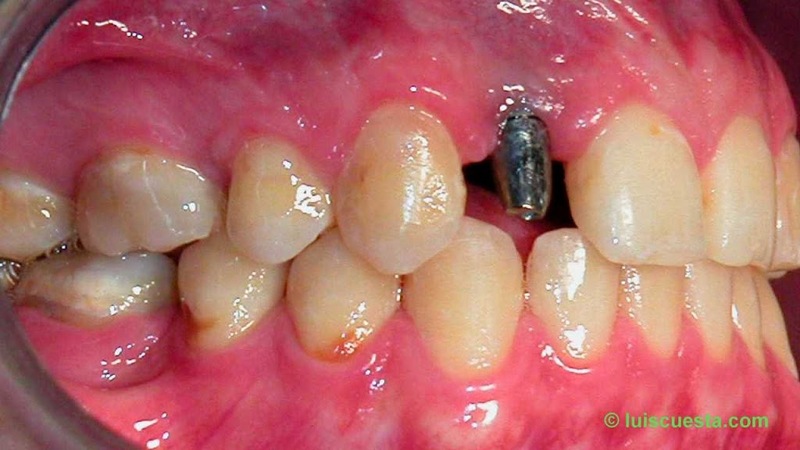 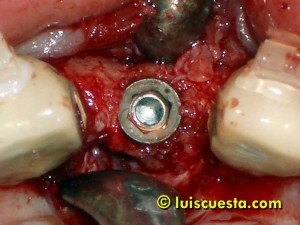 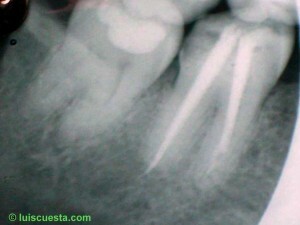 But not valid for screwed crowns if the gap opening is more than 1″ on average. In this clinical case I chose the second way and I gave the patient both the edge and the crowns, instructing her to take them in and out until the crowns fit in. A second molar can hardly be tipped back if there is a wisdom tooth behind it. 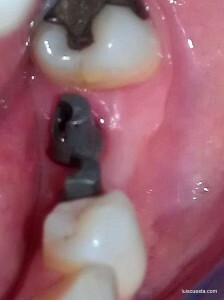 So I extracted the third molar and inserted the acrylic wedge on the same day. 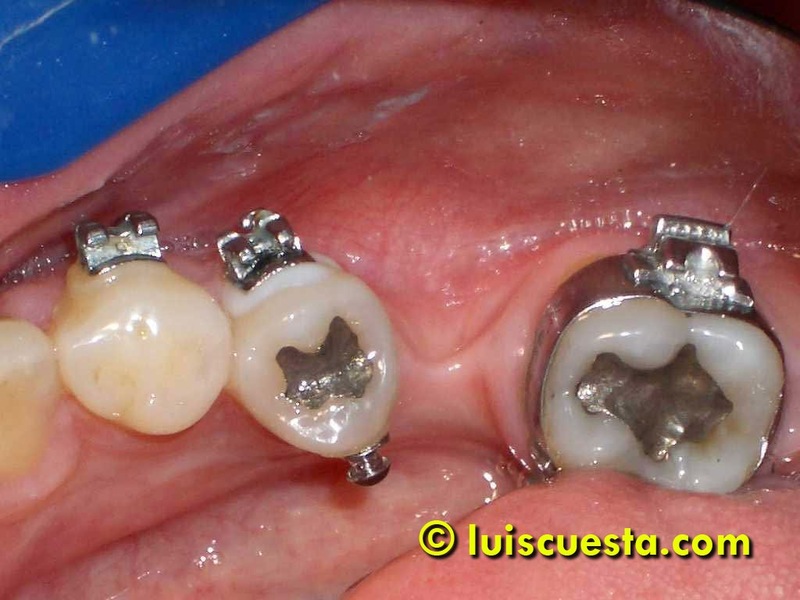 On the hand design you may see I planned to insert the front crown and only a wedge on the back implant, but the I tested it and realized that the wedge was more stable with a double post retention. 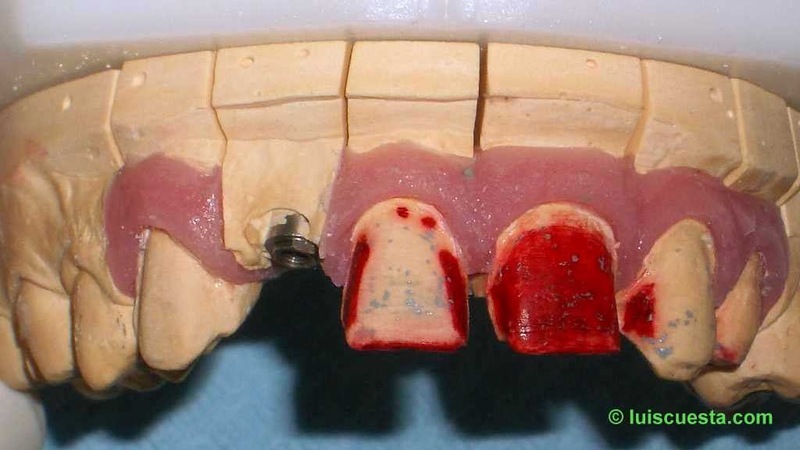 But it could have been also done with one abutment. The wedge must adapt passively on the front and ut must have an inclined rear surface that pushes the molar back while the occlussion keeps the wedge in place. 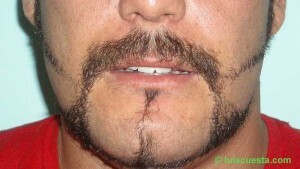 There will be subsequently an increased bite heigth, resulting in no front contacts and premature contact on the wedge and the implants underneath. 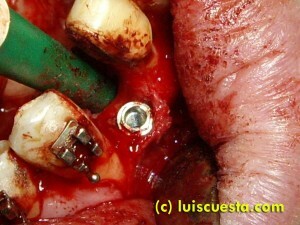 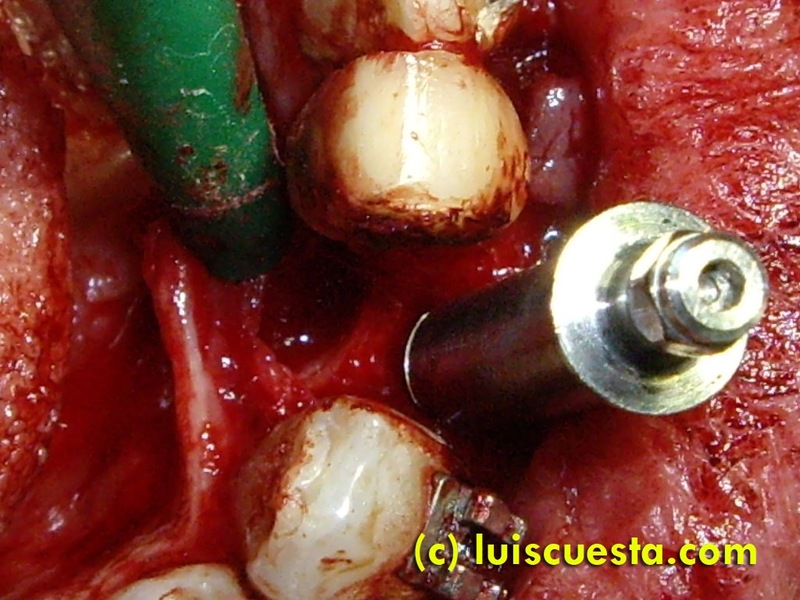 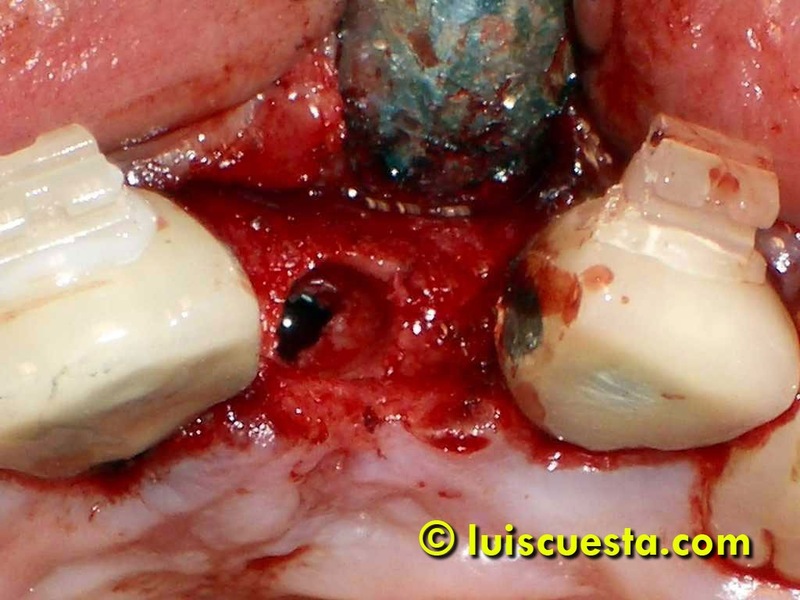 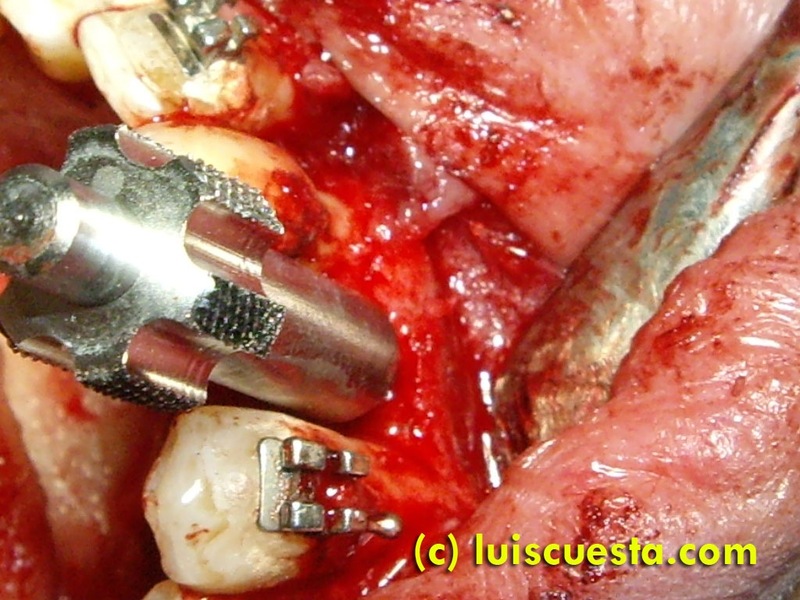 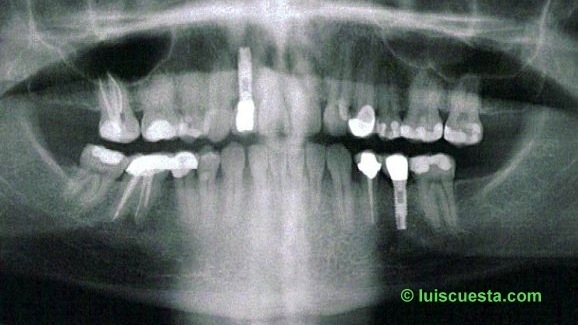 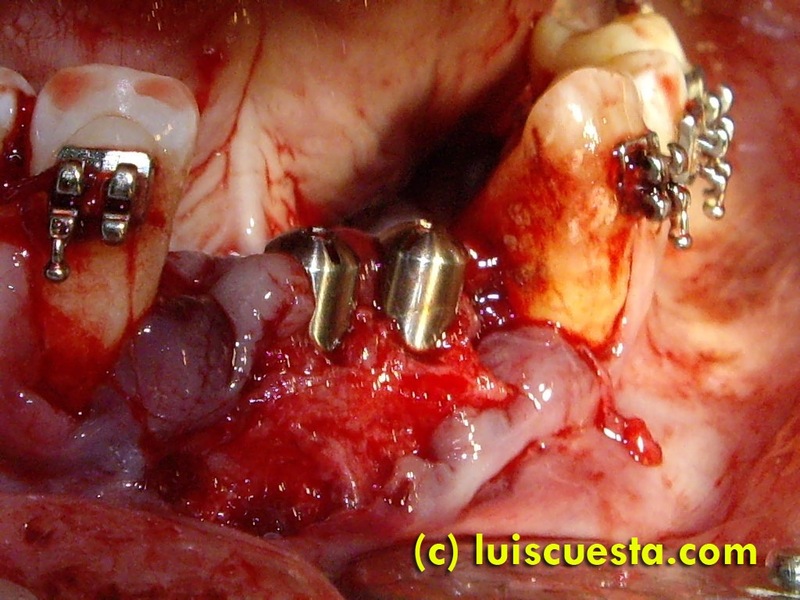 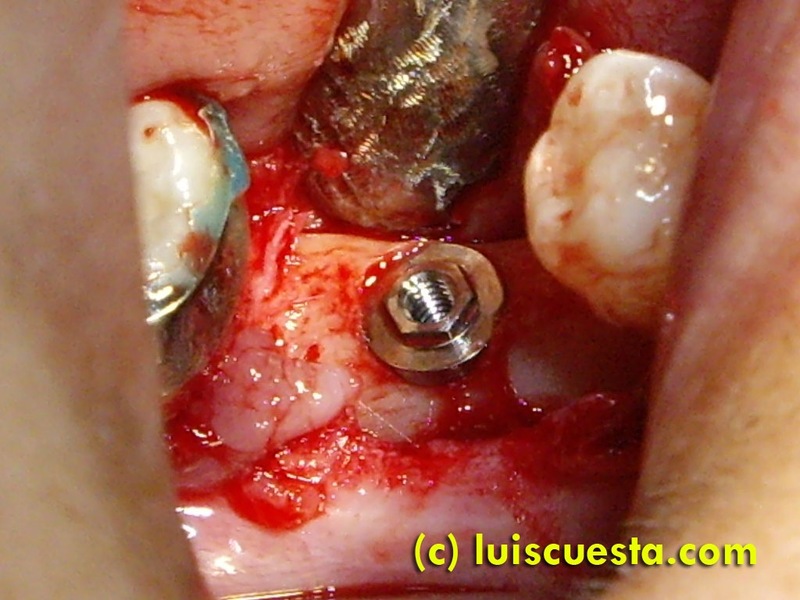 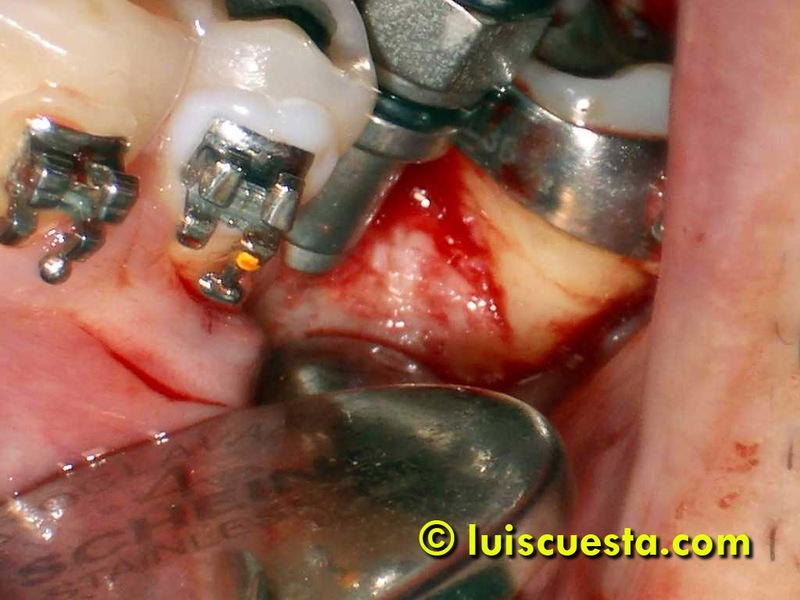 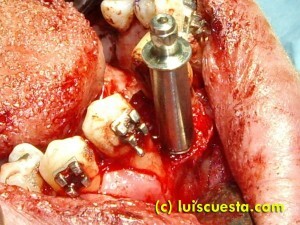 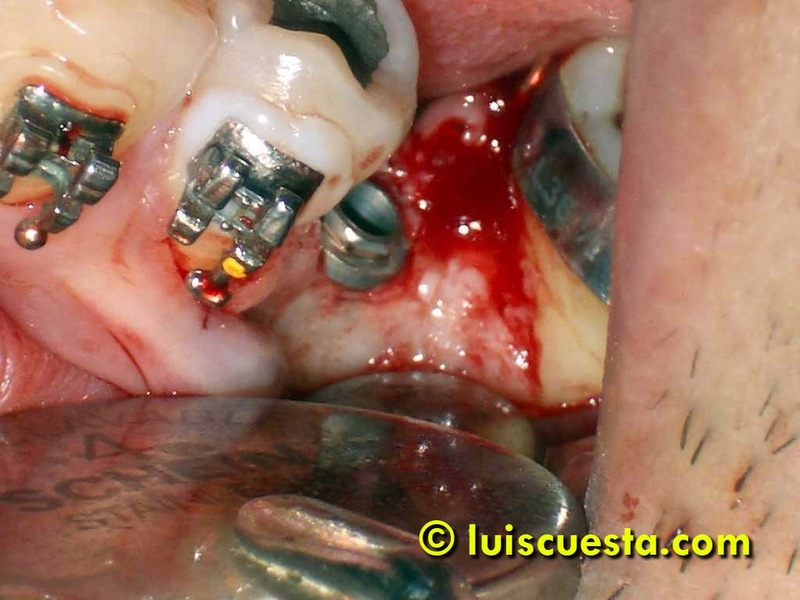 You may want to allow the implants a longer healing period just to assure full osseointegration. 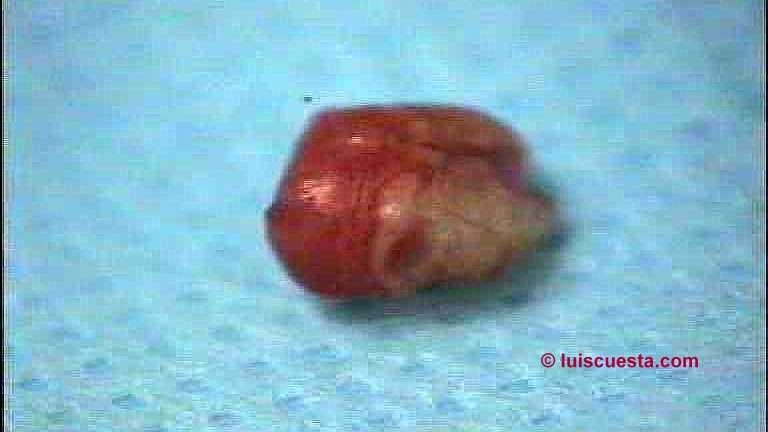 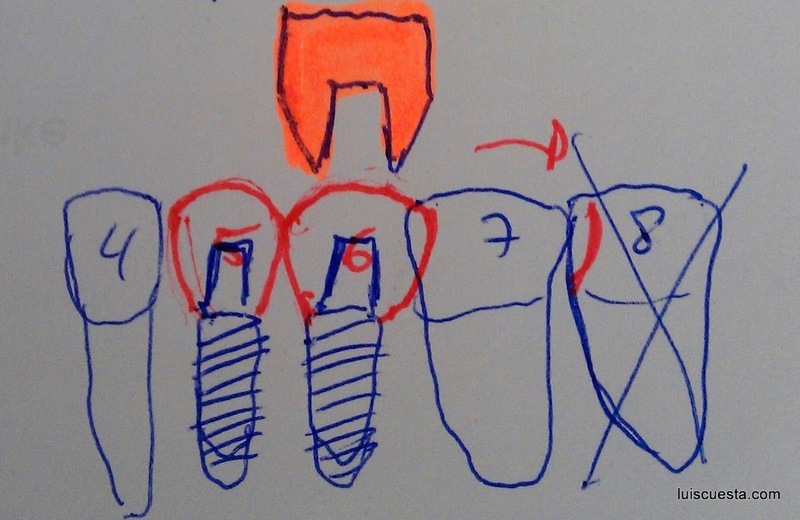 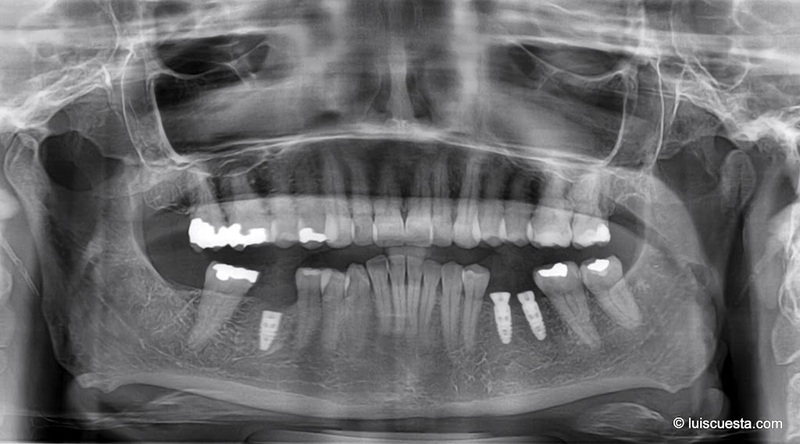 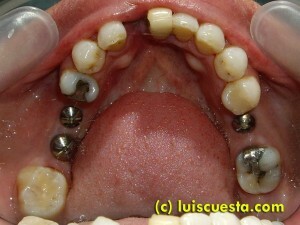 You need to tell the patient that he/she should not overload the implants by bitting hardly on them, and that the molar will move back gently in a few days or a few weeks, depending on different factors (bone density, extraction distally, degree of tipping vs. amount of distal movement). 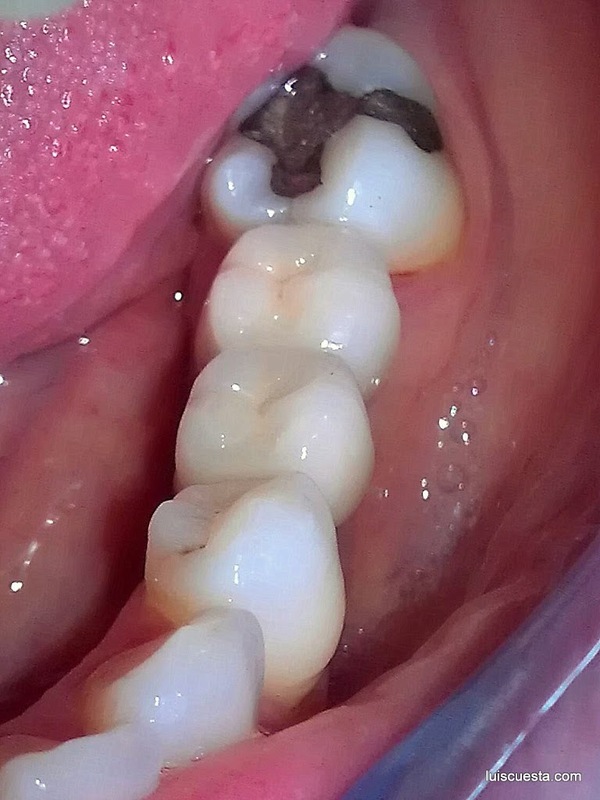 You may need to schedule some control appointments, checking how the molar moves back and the bite closes down. 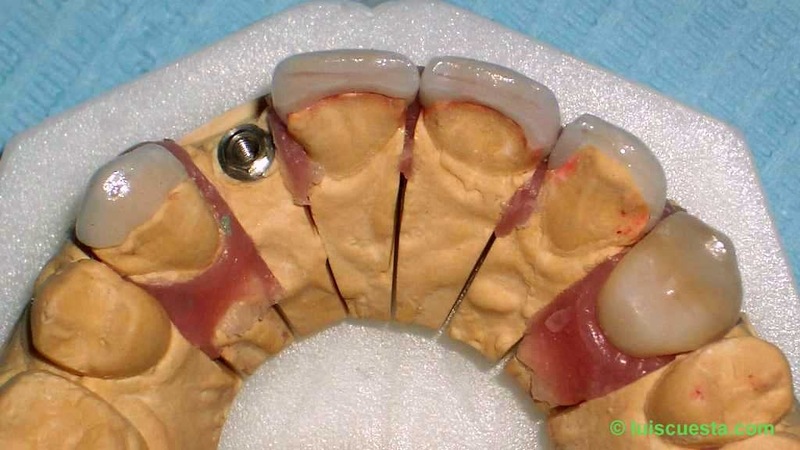 If that doesn’t happen, you may need to introduce some changes in your wedge design or confirm that the patient carries it at all times. There will be a moment, days or weeks later, when the crown can be placed on the abutment and fits in with more or less pressure. 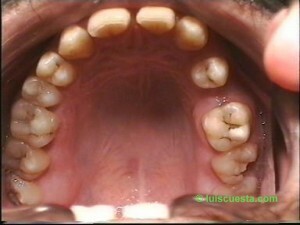 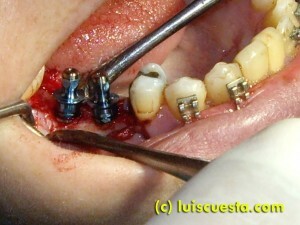 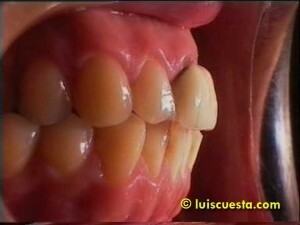 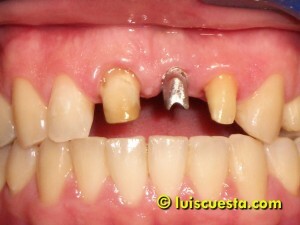 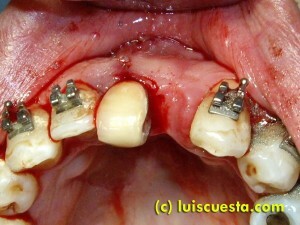 This can be done by the dentist or also by the patient at home, providing he/she was properly instructed on this task. Normally it is the crown itself that pushes the tooth back the last tenths of millimiter and falls right in place. 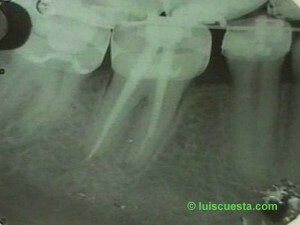 Combined case. Restorations, Orthodontics, Implants & Veneers. 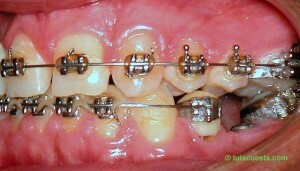 Five & ten year results. 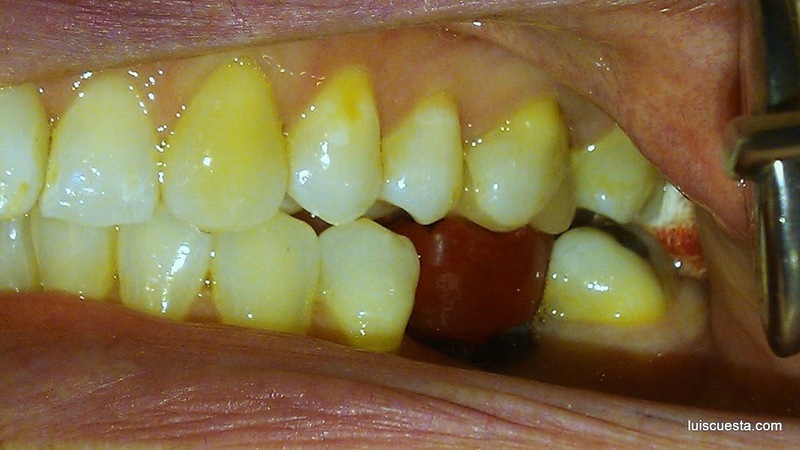 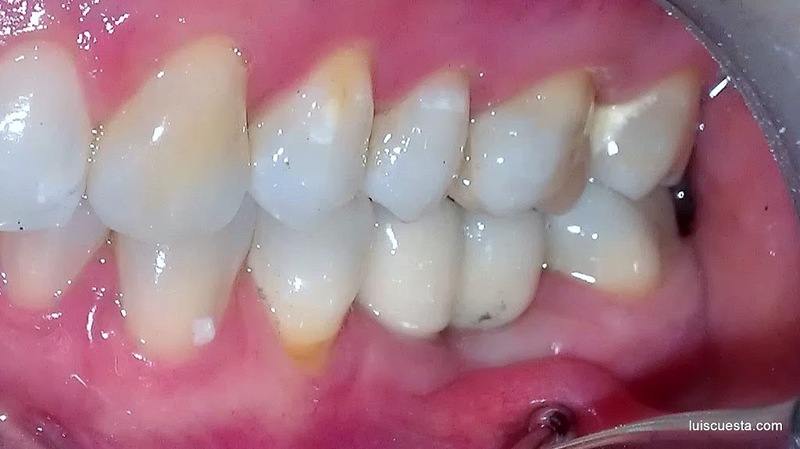 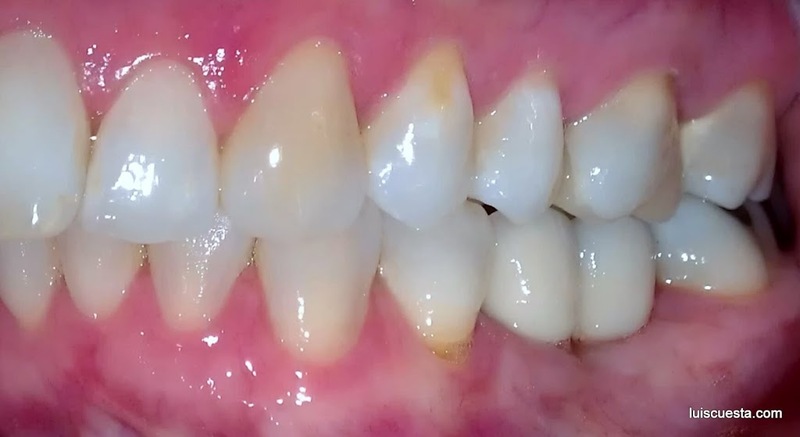 This is a quite long, combined case of orthodontics, implants, esthetic ceramic crowns and fillings, substituting the old metal ceramic and amalgam restorations for a more esthetic overall result. 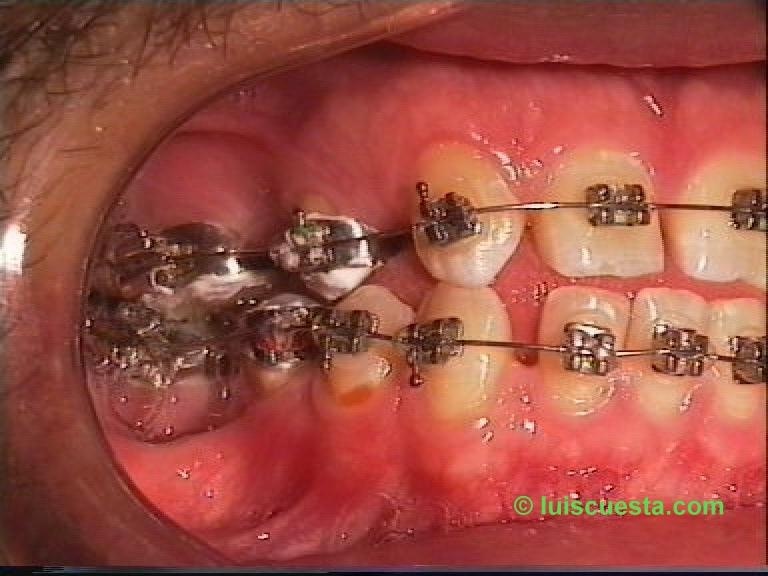 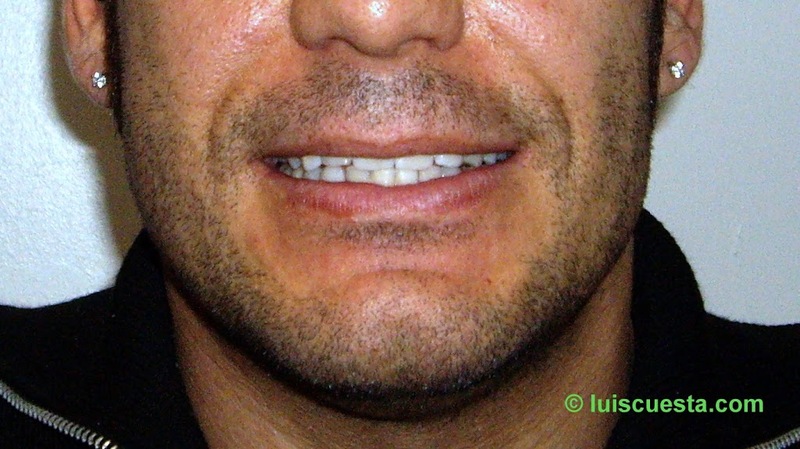 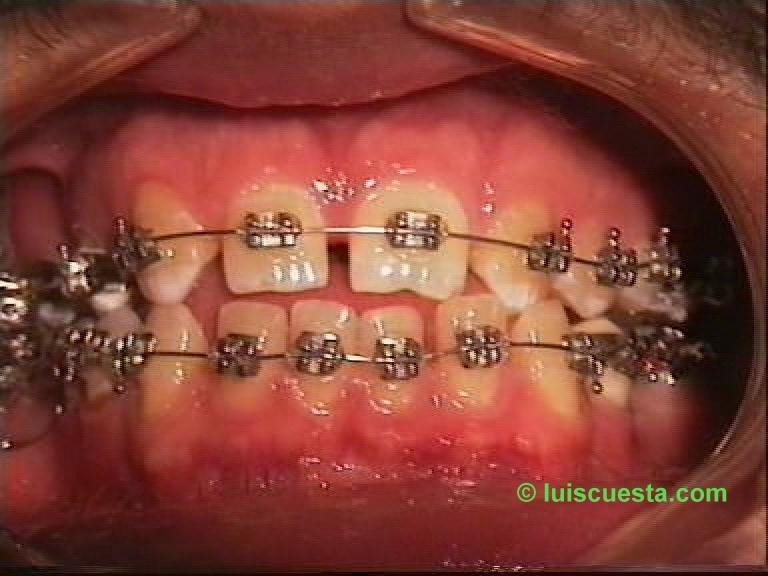 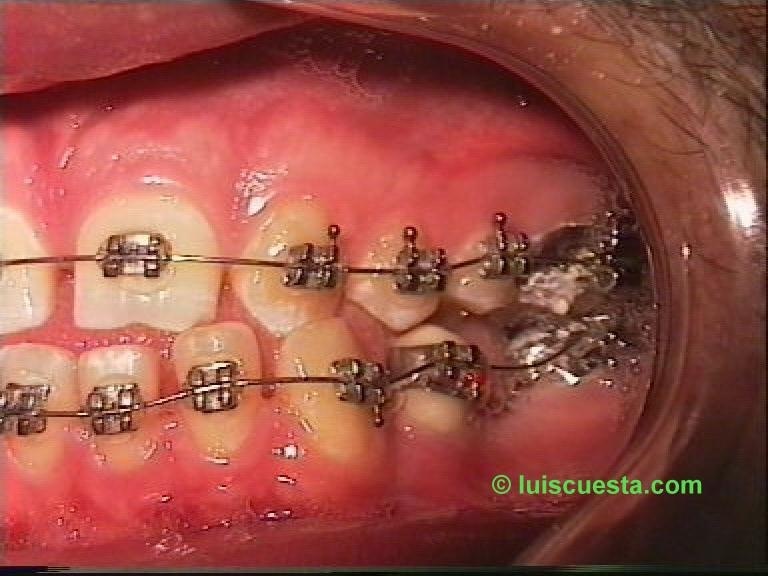 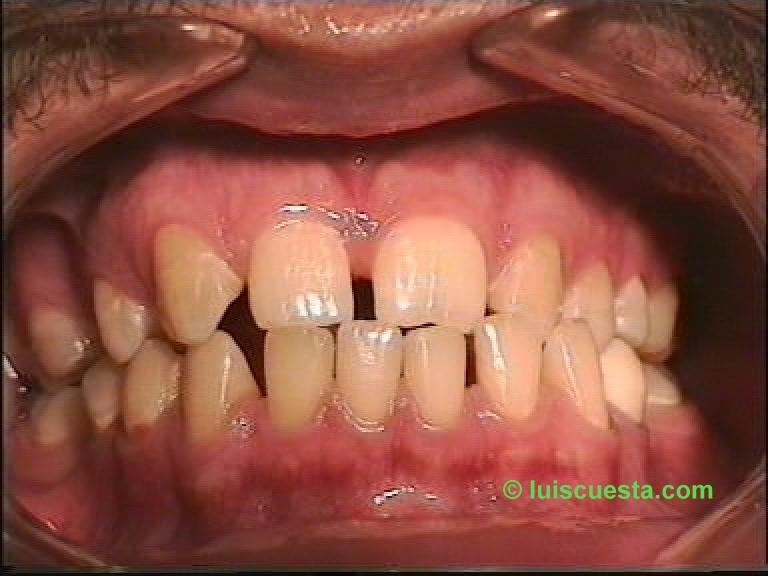 At first stage, I want to use orthodontics in order to close the space of the missing upper second bicuspid, move the mid lines to the left and reduce protrusion. So I cut the 24-25 bridge, apply full Roth .022″ ceramic braces and start moving the pieces with elastics and springs on .016″ round wire. 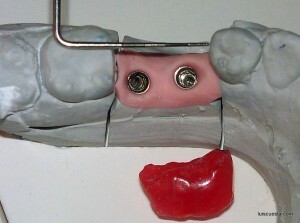 When the turn comes to the 11-22 bridge, I cut it in between 21-22 to liberate 22 for motion with springs. 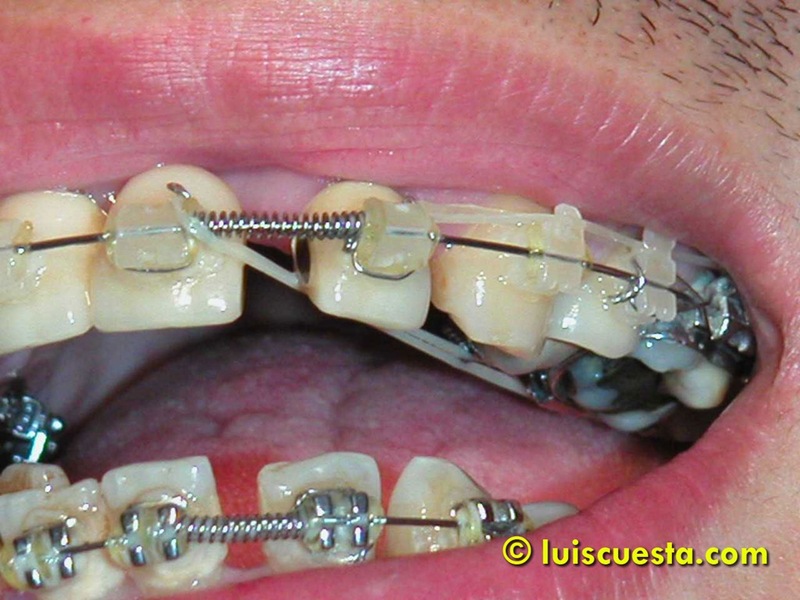 I used elastics on 21 to prevent from rotating, since the spring force will act with high leverage on 11. 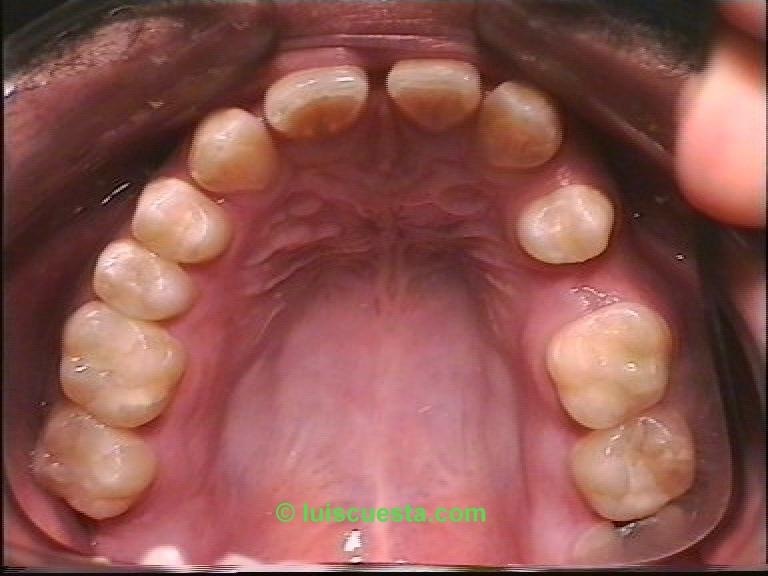 Now it’s time to move the central incisors and the midlines to the left, also progressively, one tooth at a time. 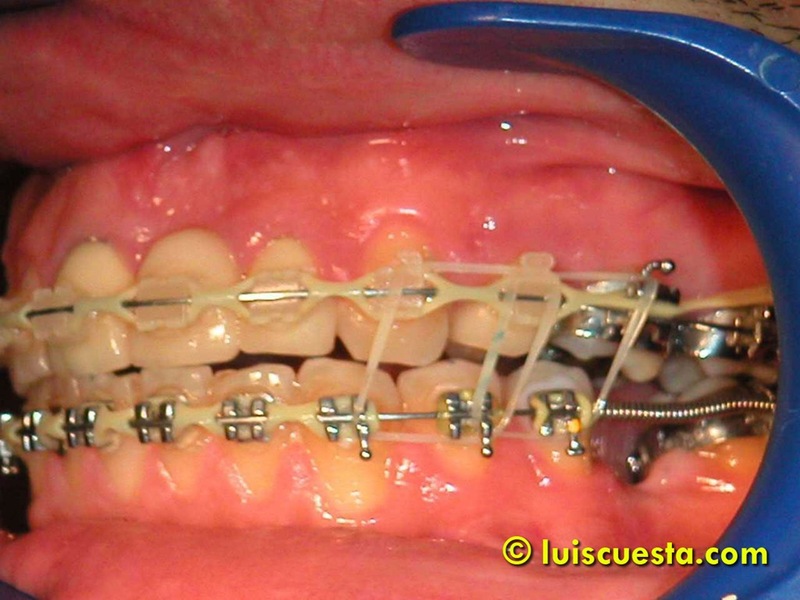 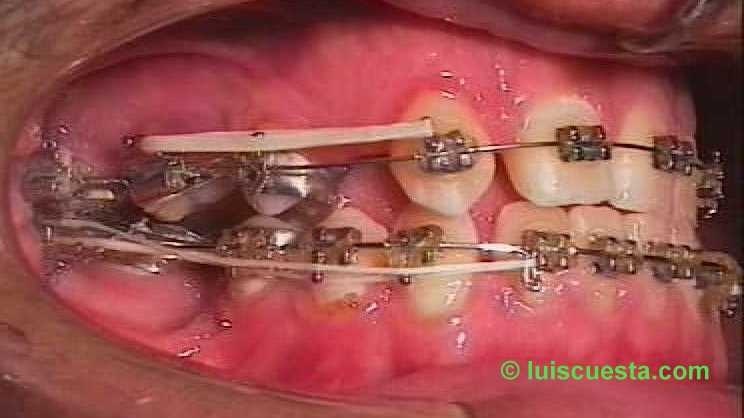 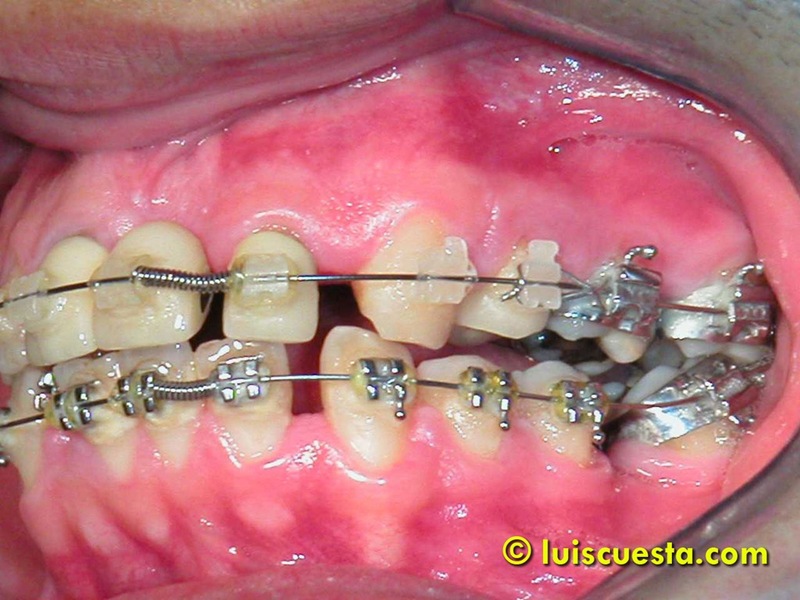 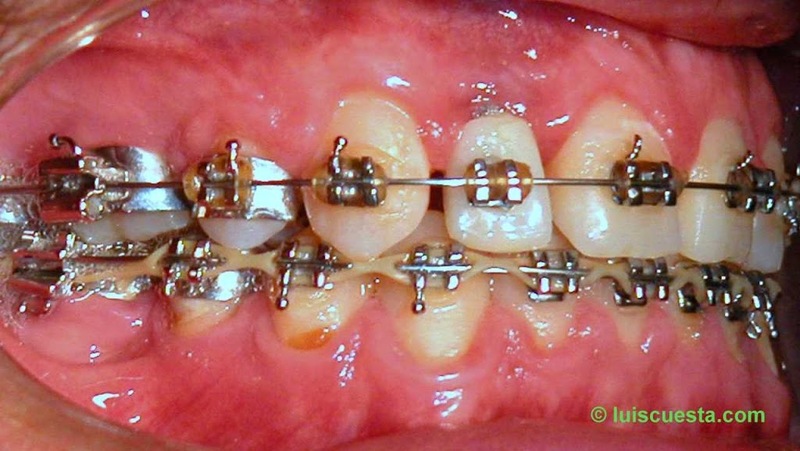 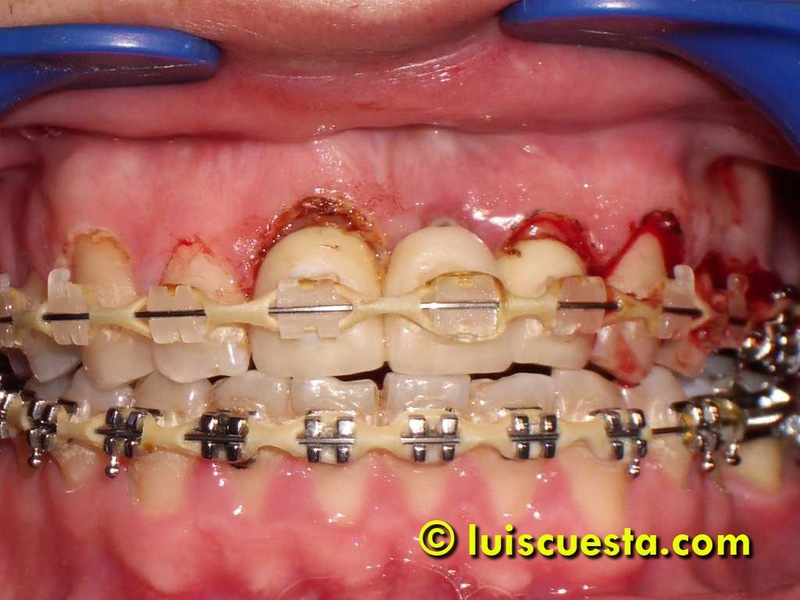 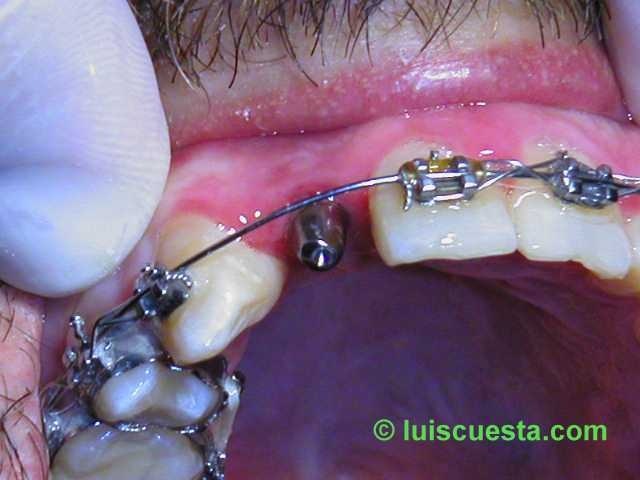 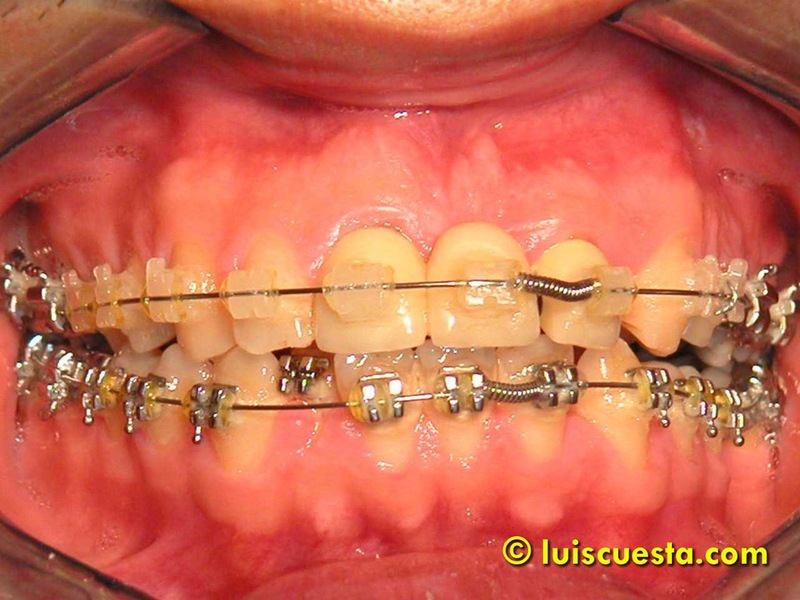 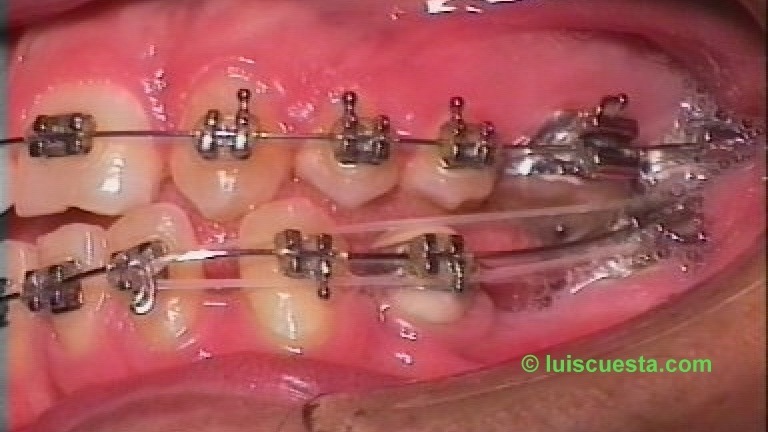 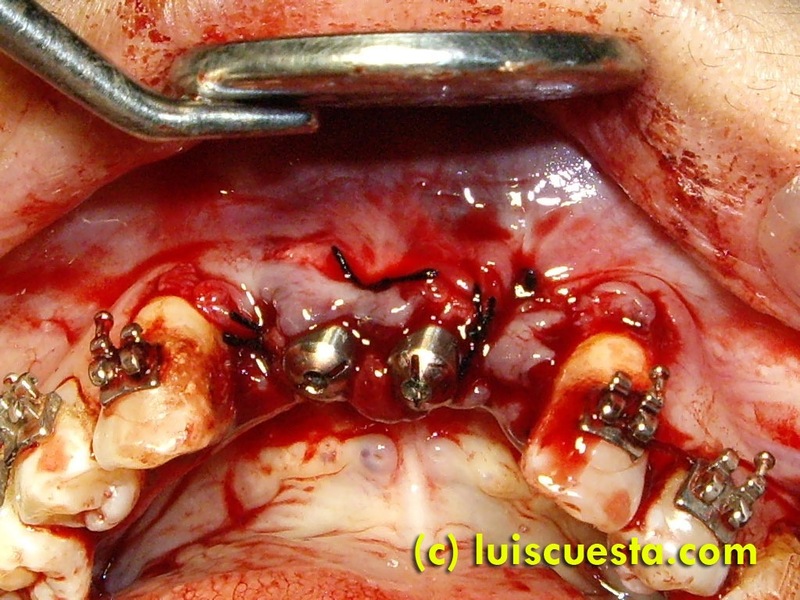 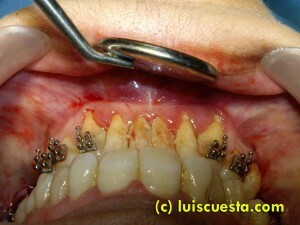 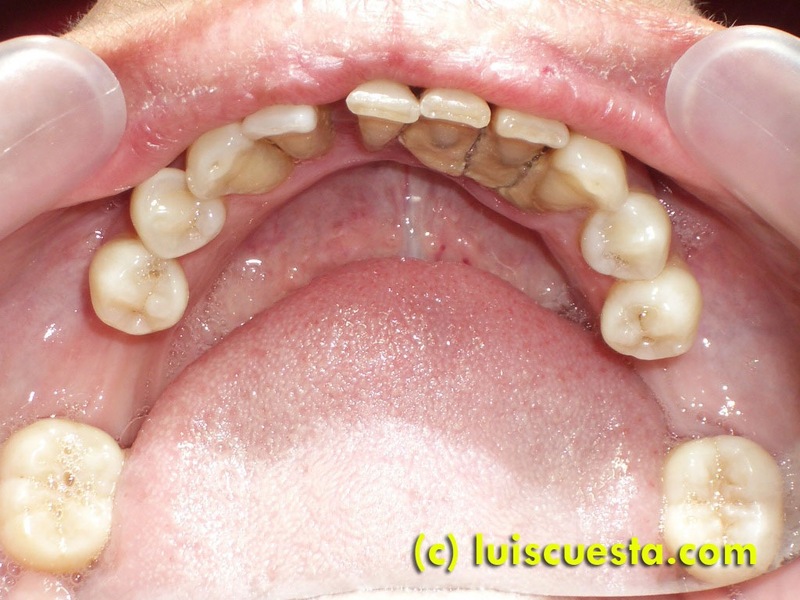 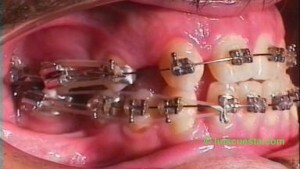 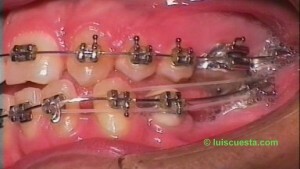 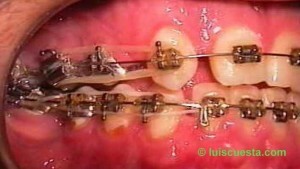 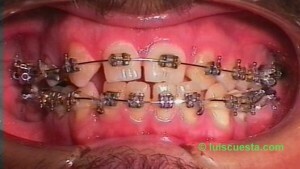 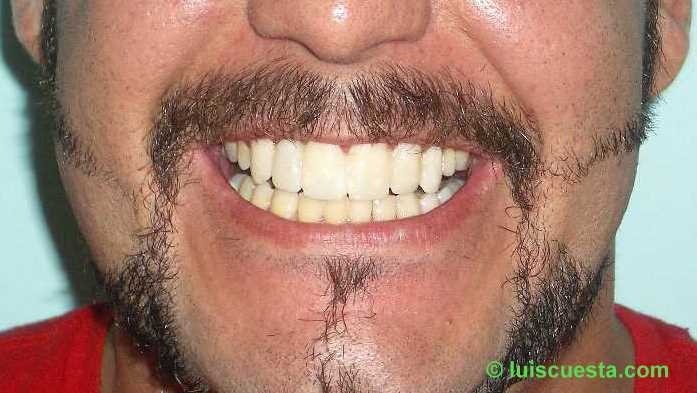 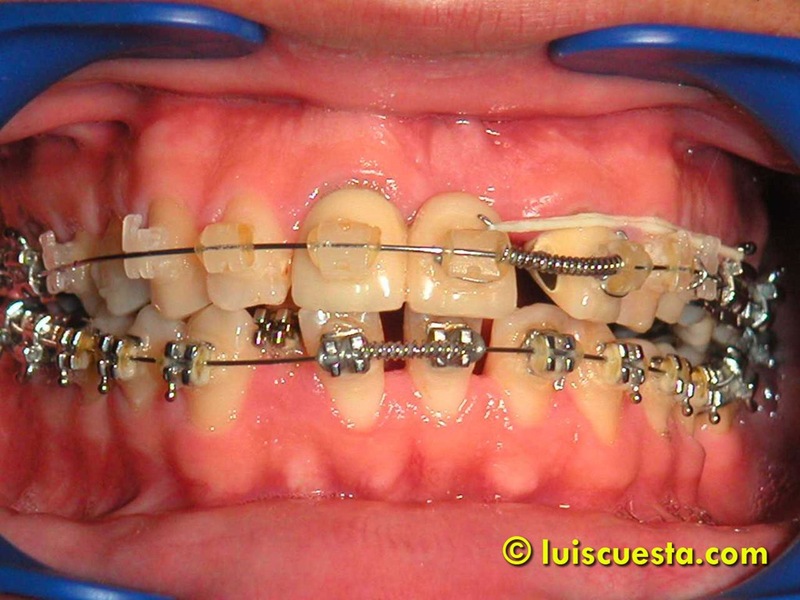 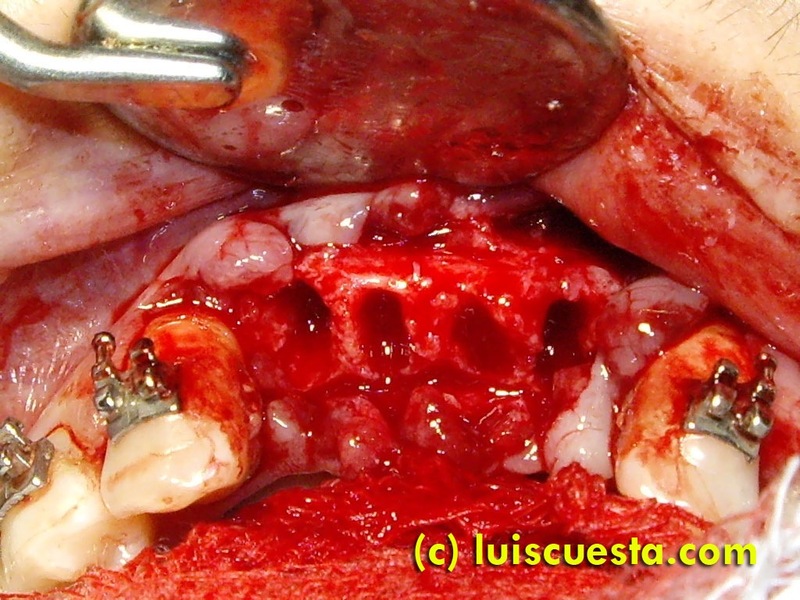 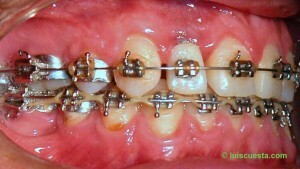 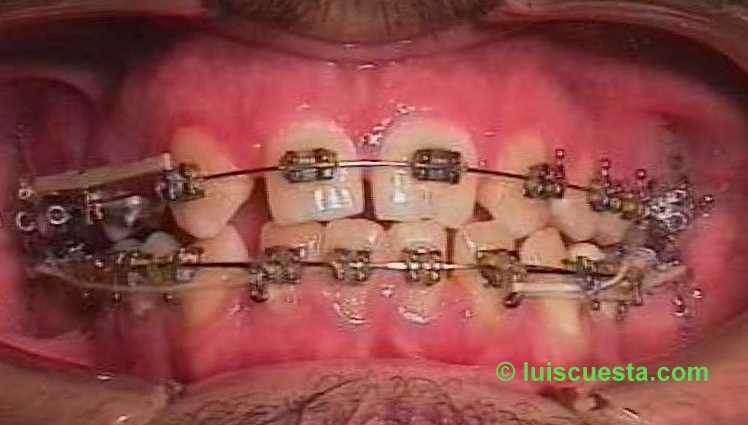 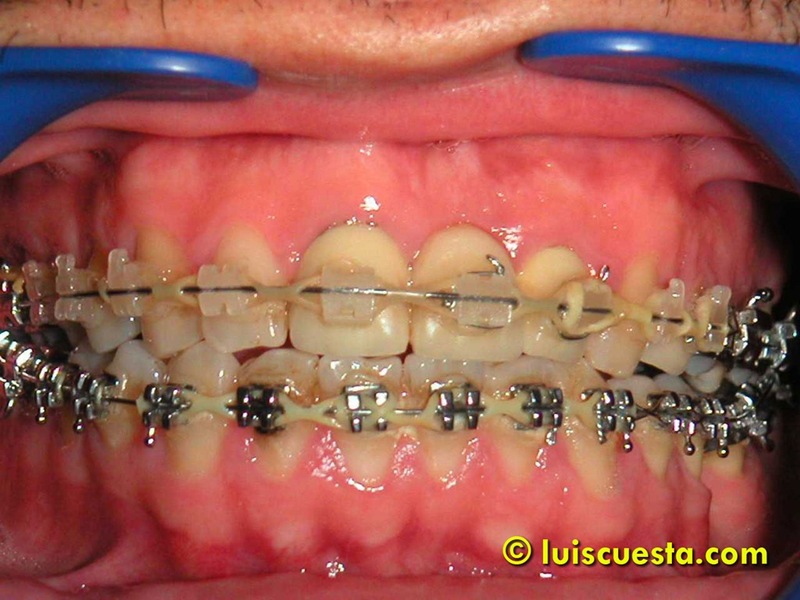 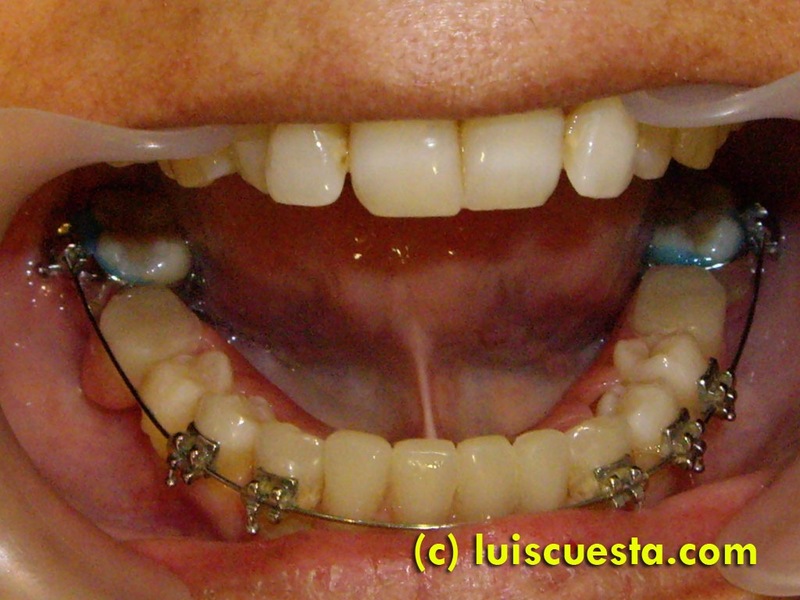 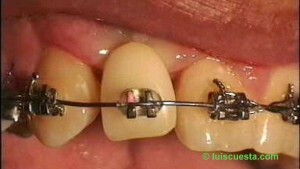 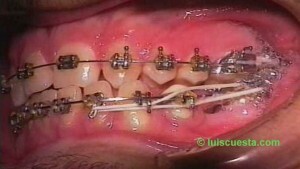 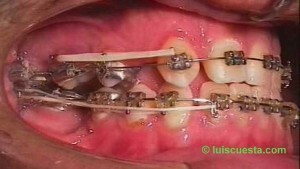 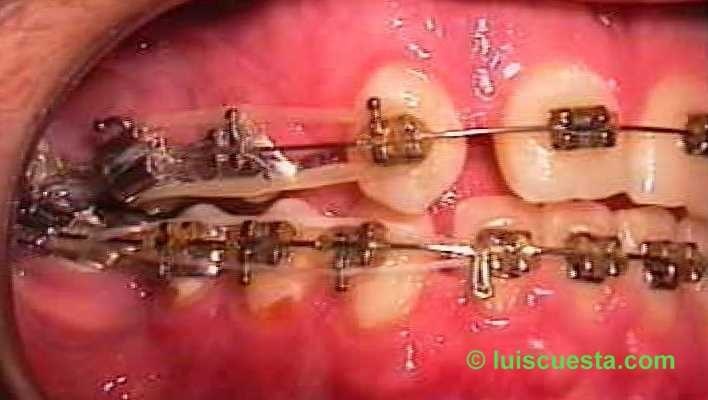 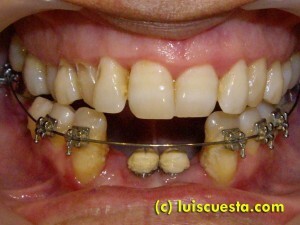 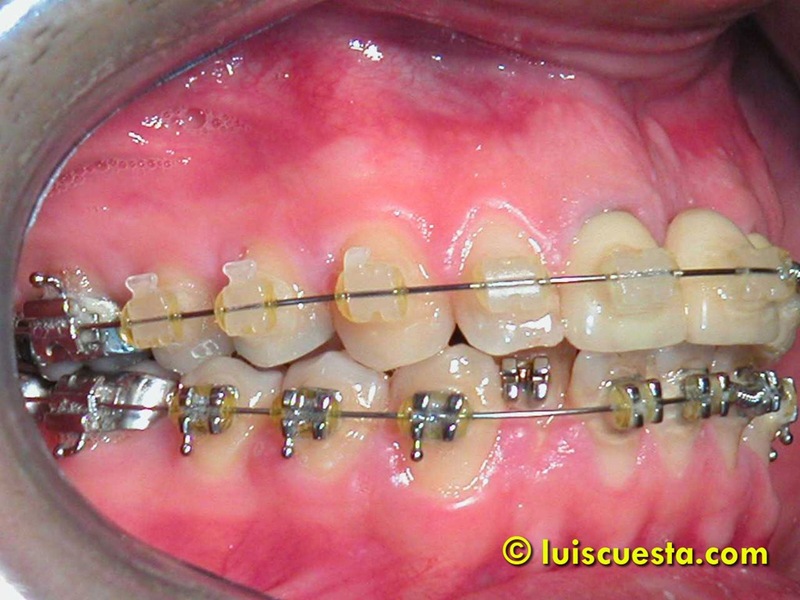 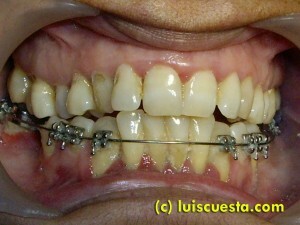 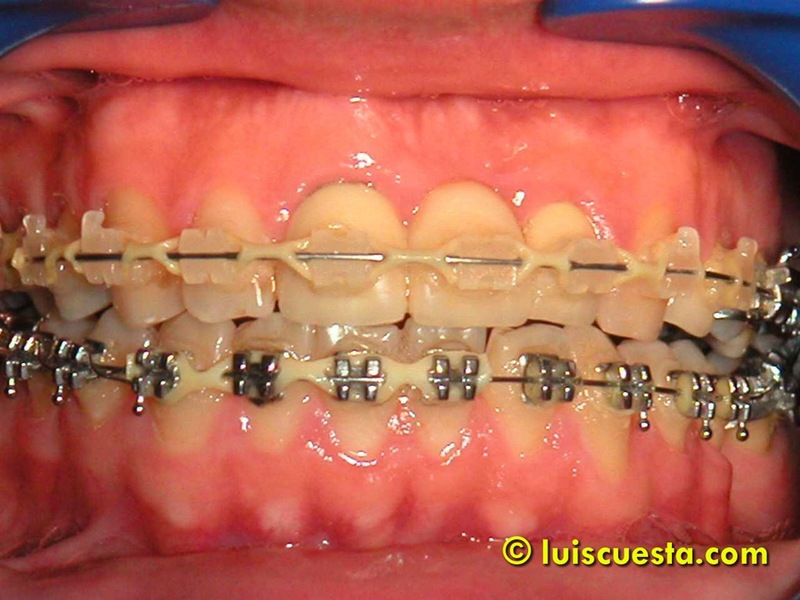 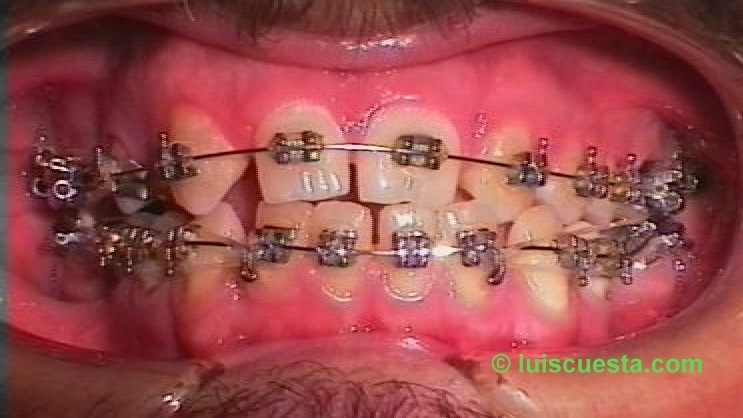 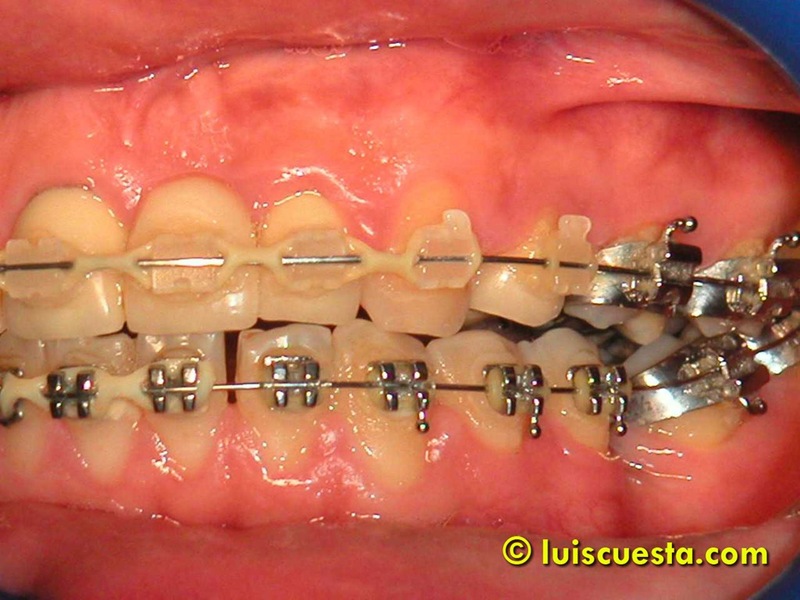 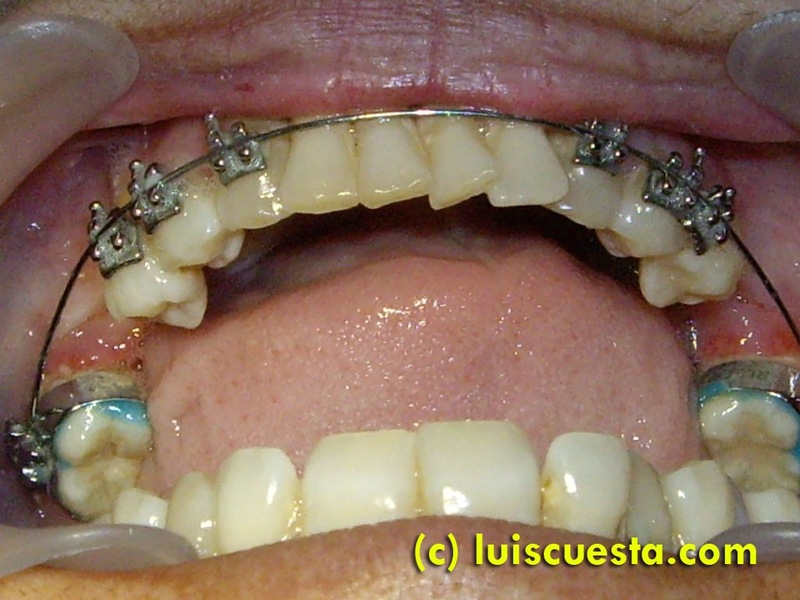 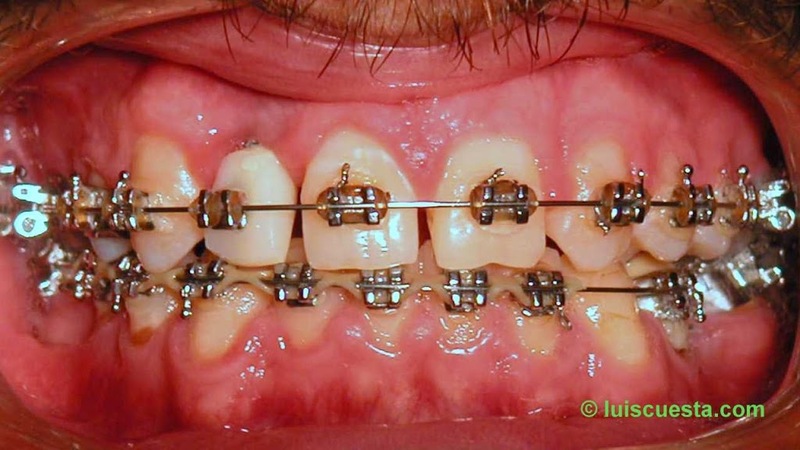 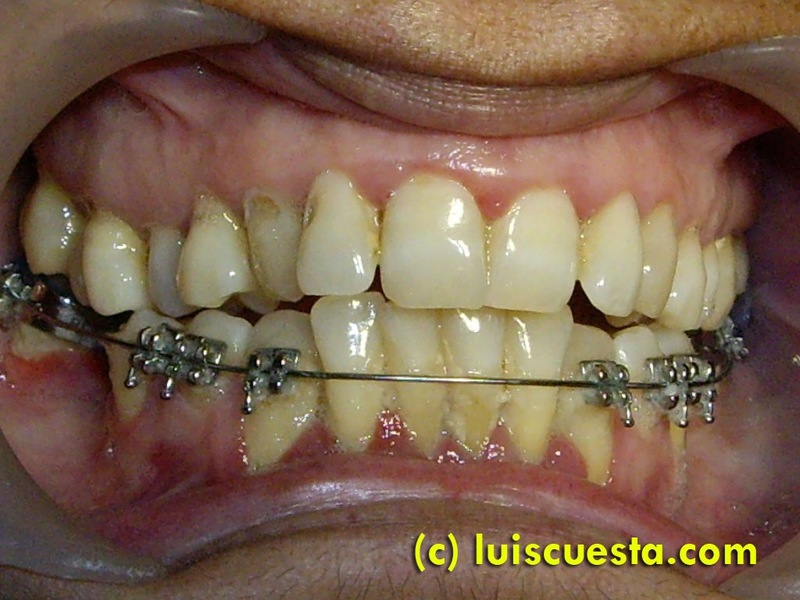 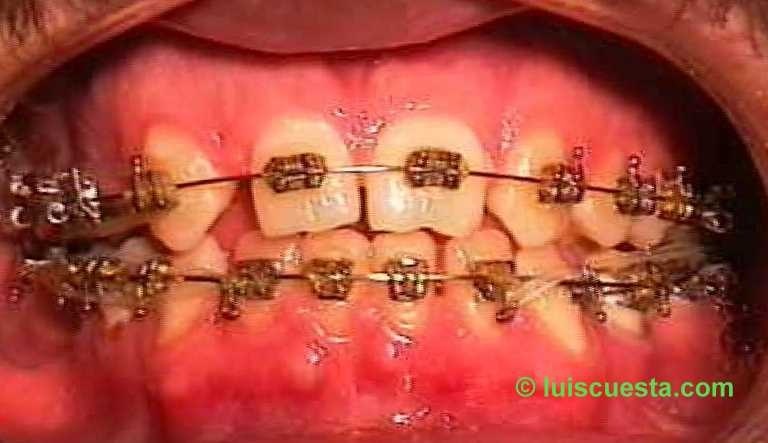 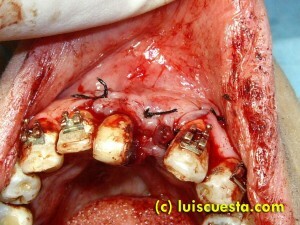 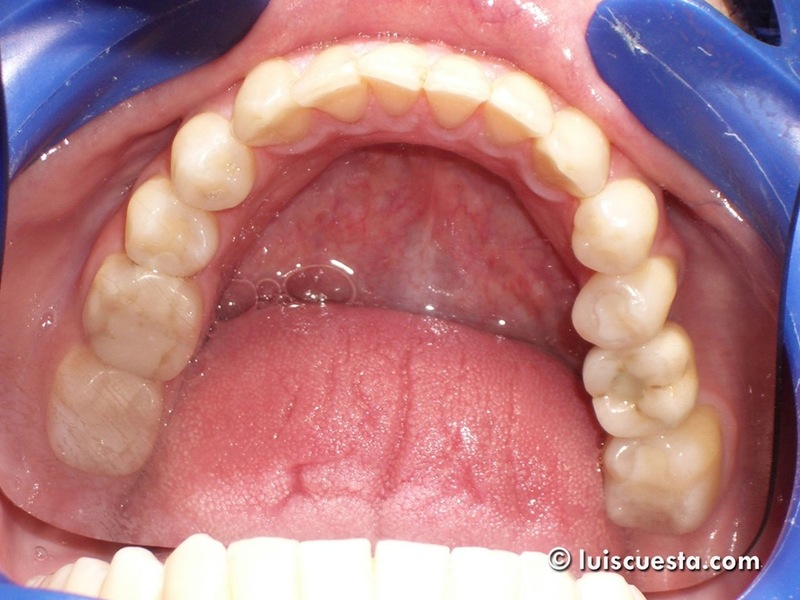 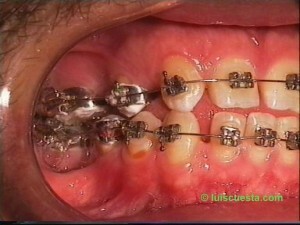 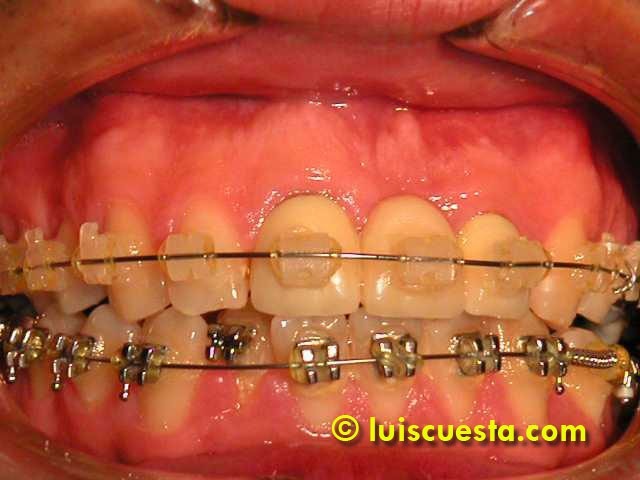 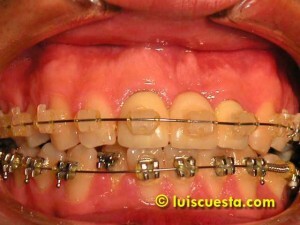 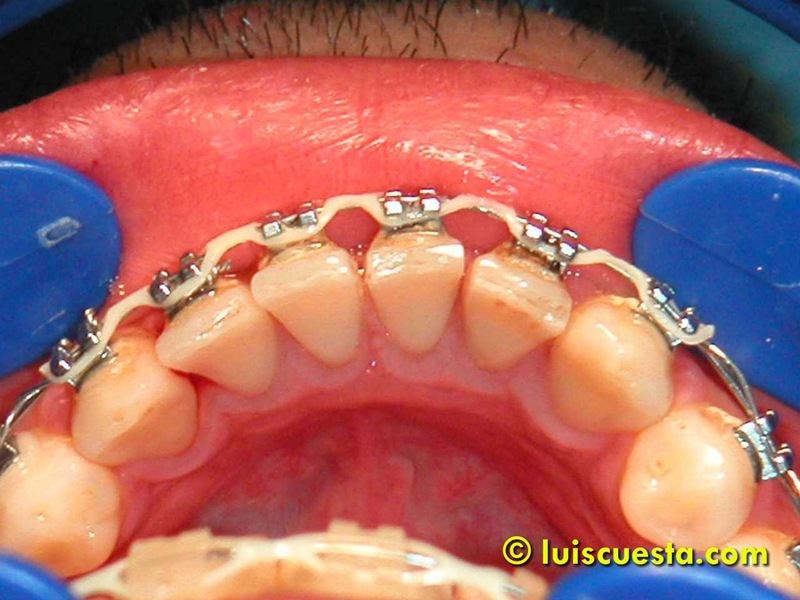 When the upper incisors reach the symmetric position, I close the gaps with chained elastics. When the space is crated for 41, I bring it into the arch and do a little stripping. 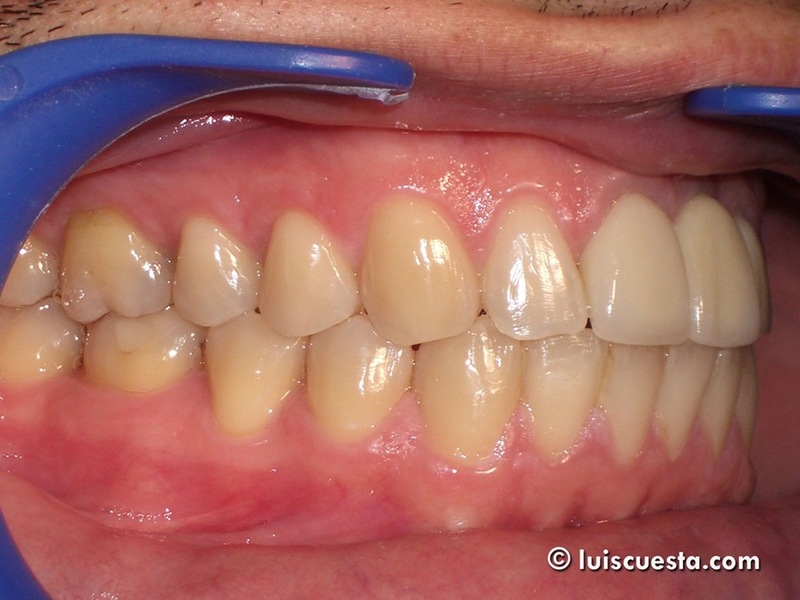 Final adjustments on the lower incisors after stripping. 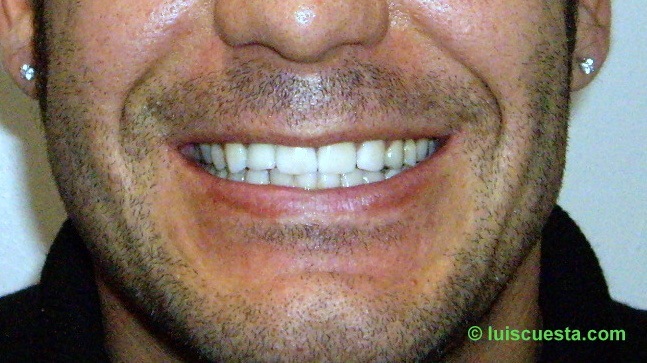 Midlines aligned with the nose. 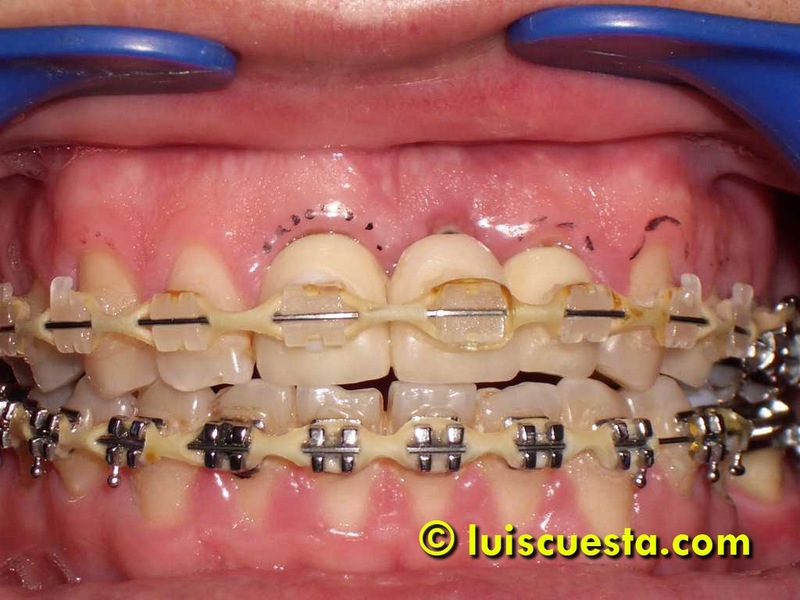 Finishing inter-arch elastics for maximum intercuspidation, and opening spring to back-tip 37 and allow for implant placement. Now the spaces are not at their final size, but they are enough as to place the implants. I place two Alpha Bio implants. 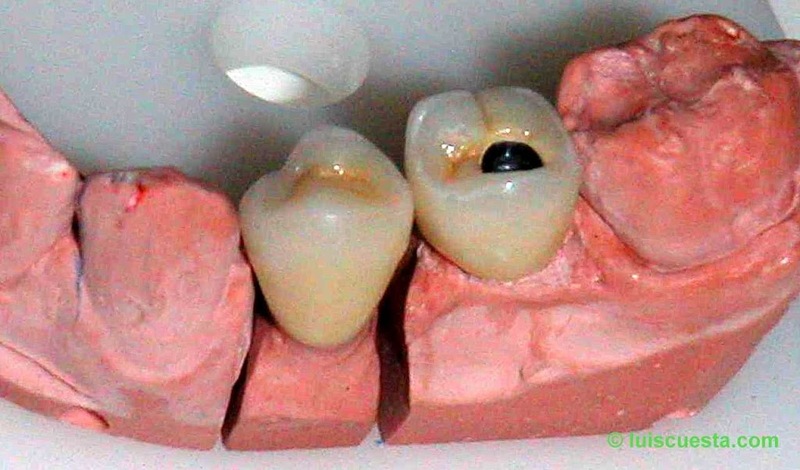 36 is a 3.75×15″ external hexagon, and 21 is a 3.75×16″ internal hexagon. I needed to cut the 11-21 bridge, do some ridge widening with osteotoms, and hang the loose 21 crown on the wire. 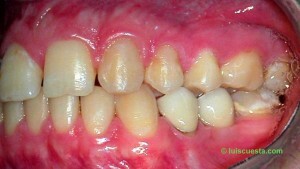 When healing takes place, I set the gums with future esthetic tooth proportions. 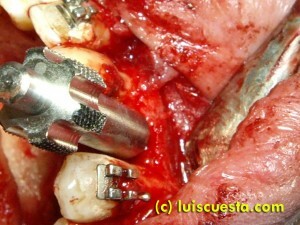 I use electric scalpel for the gingivectomy. 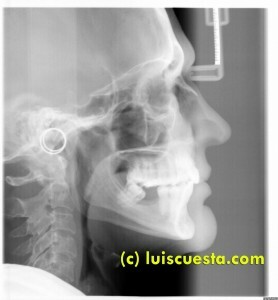 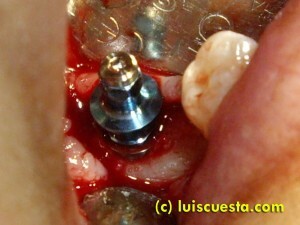 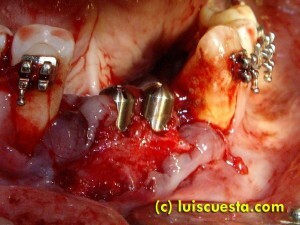 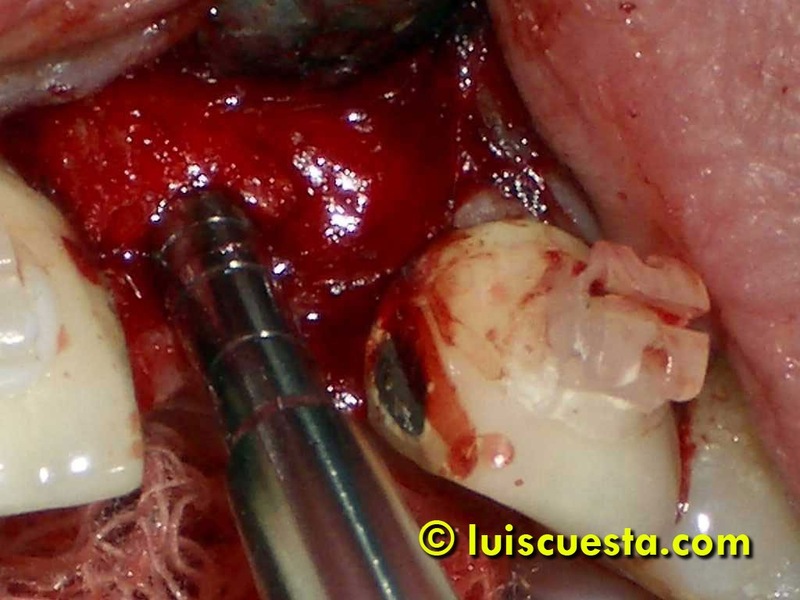 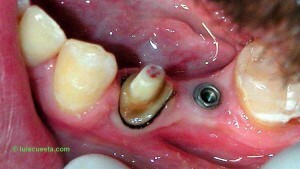 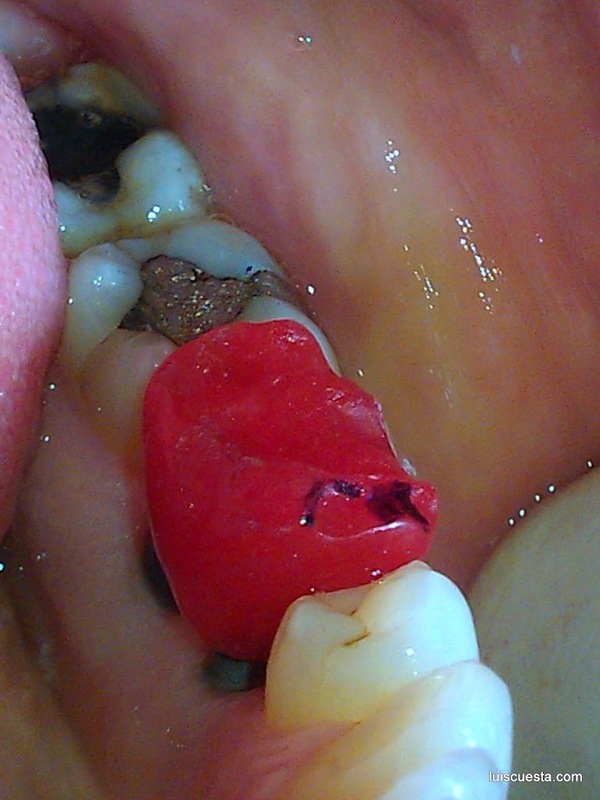 I used the spring after the implant placement to continue opening the space for a molar. That rotated the premolar forward. 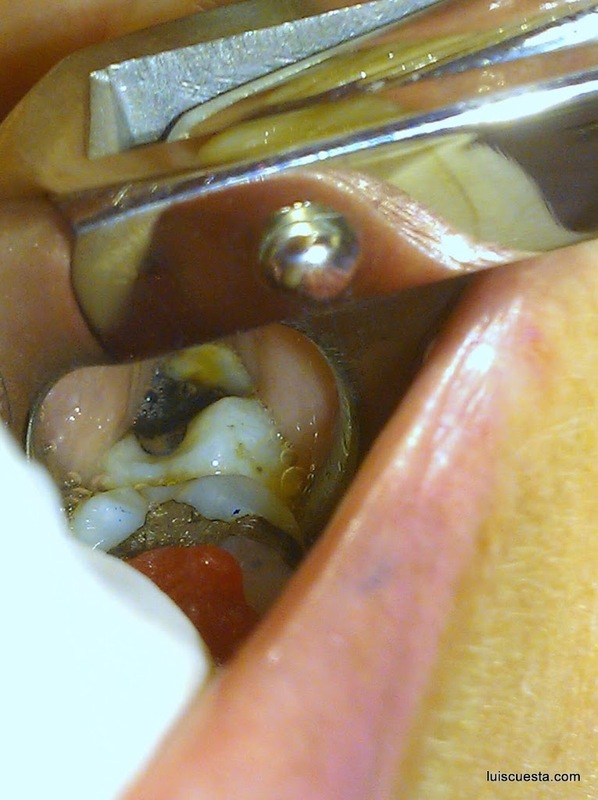 I cut the implant transporter as to allow occlusion and attach a premolar band with Dura-Lay resin in order to de-rotate the premolar back in place. 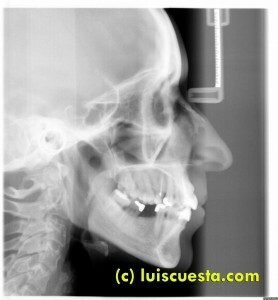 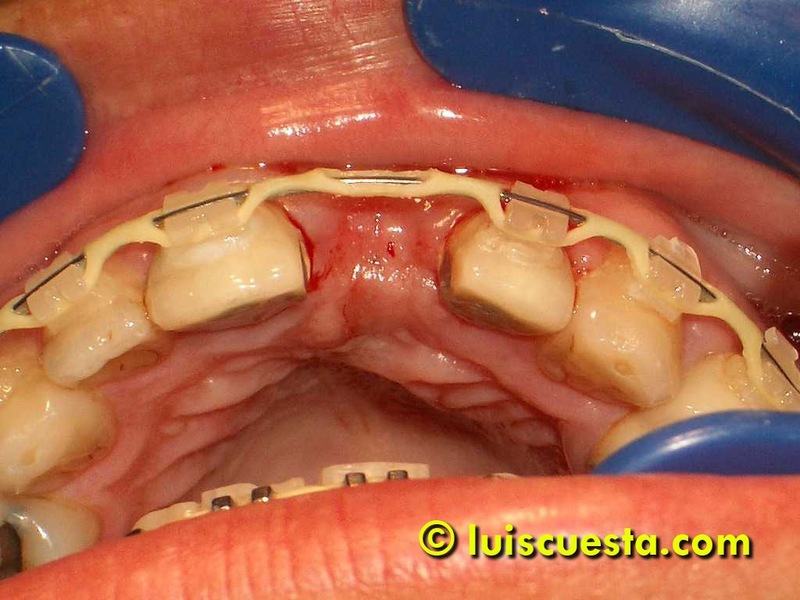 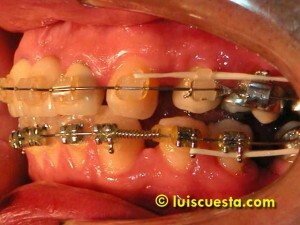 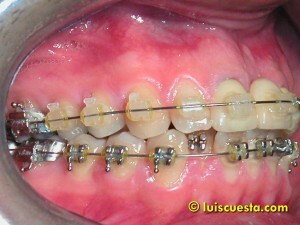 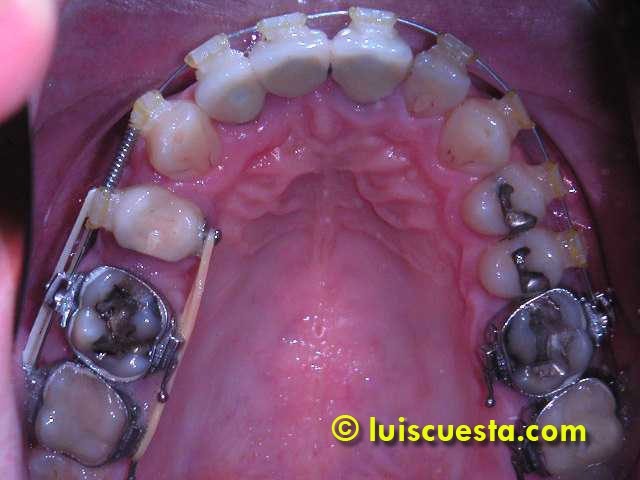 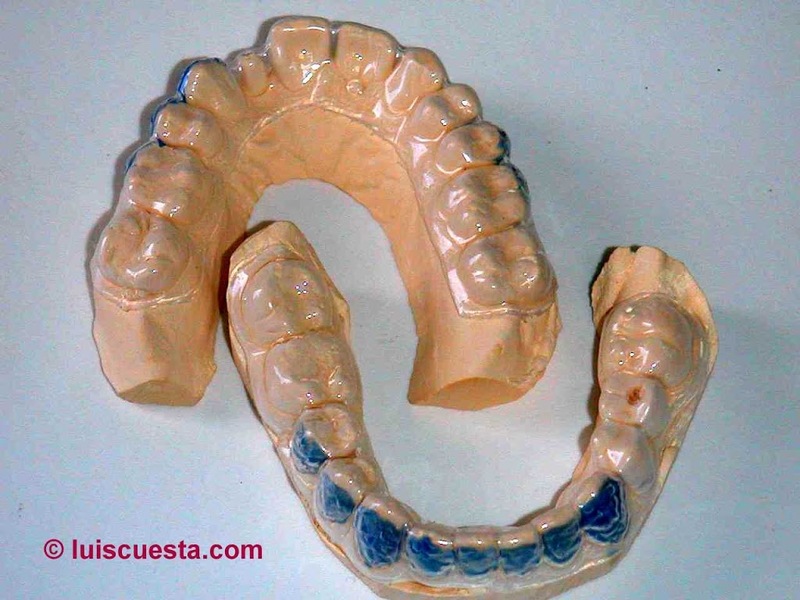 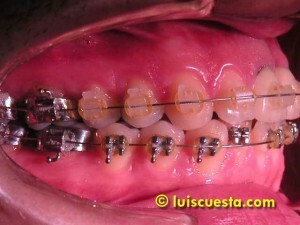 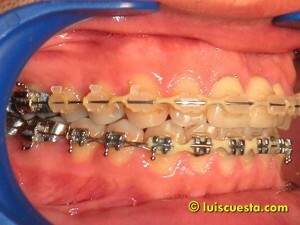 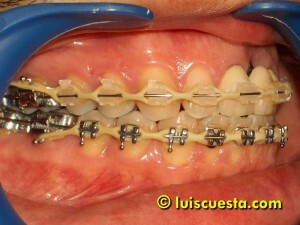 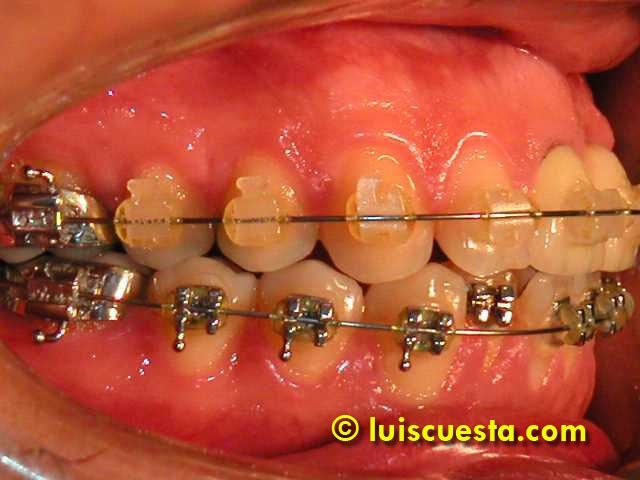 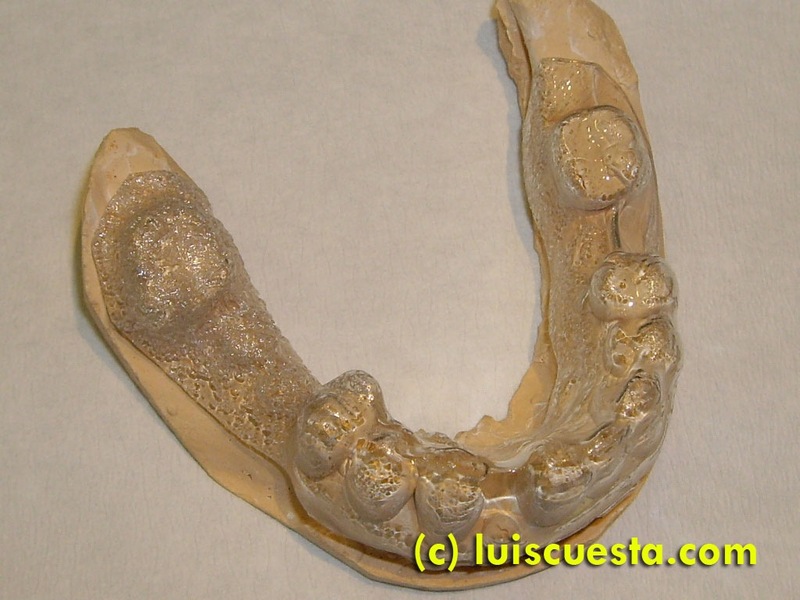 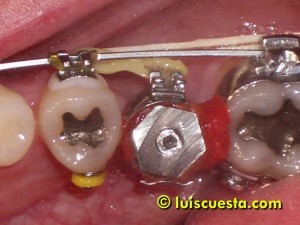 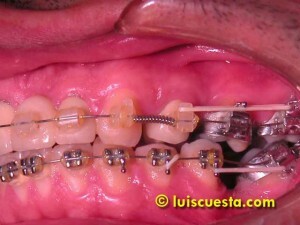 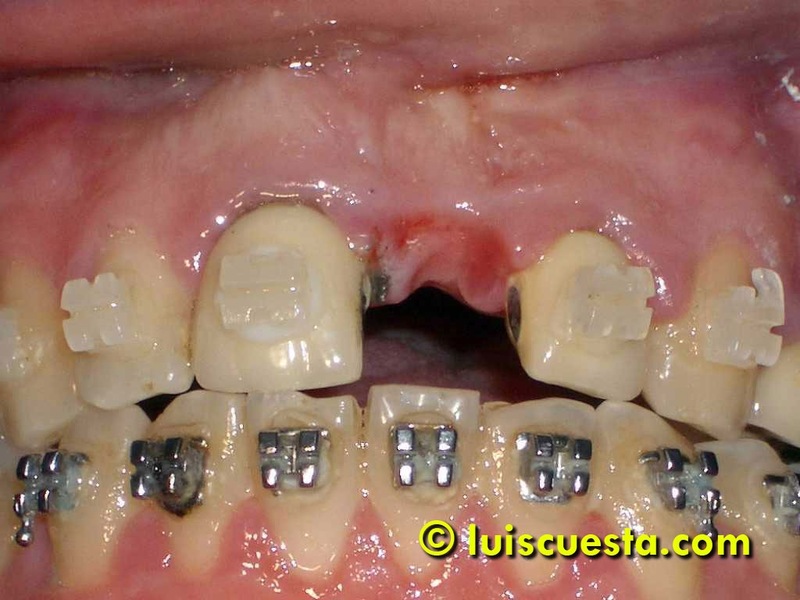 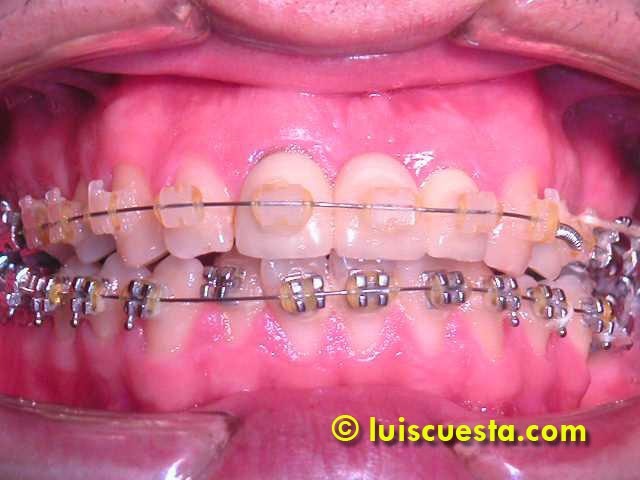 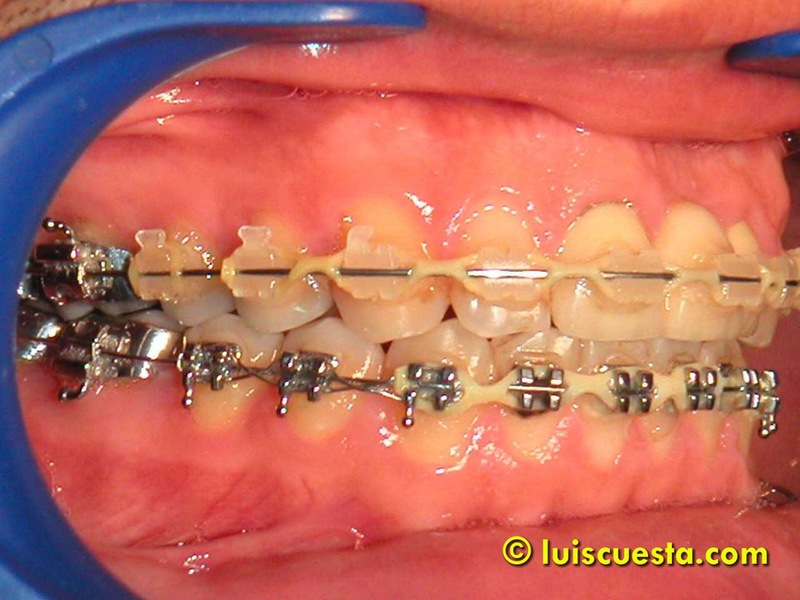 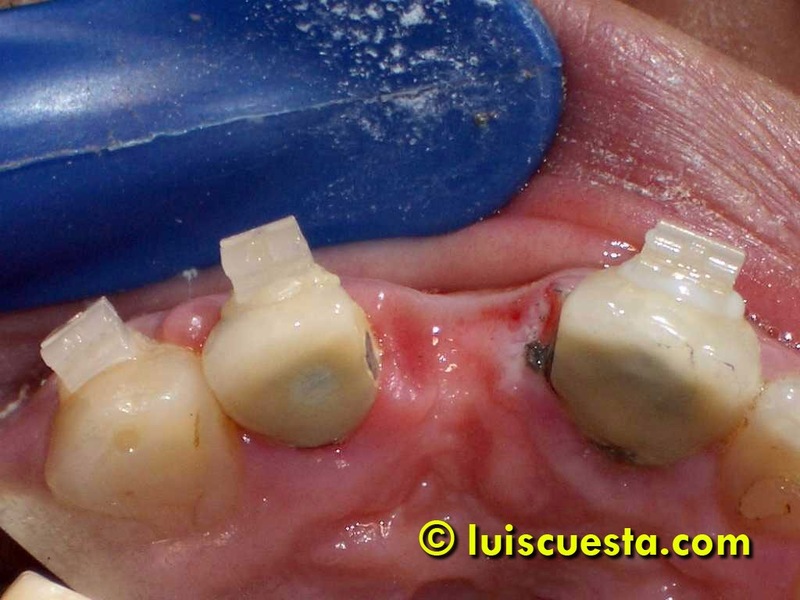 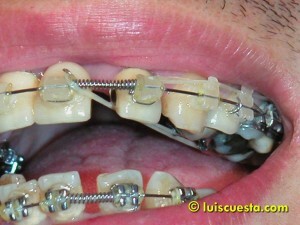 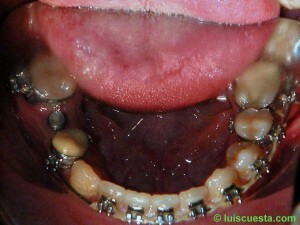 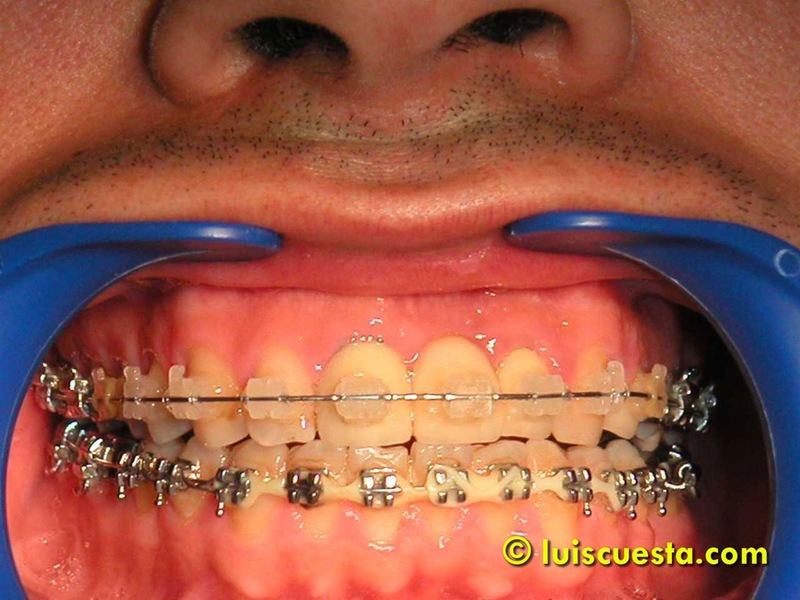 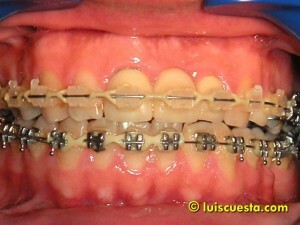 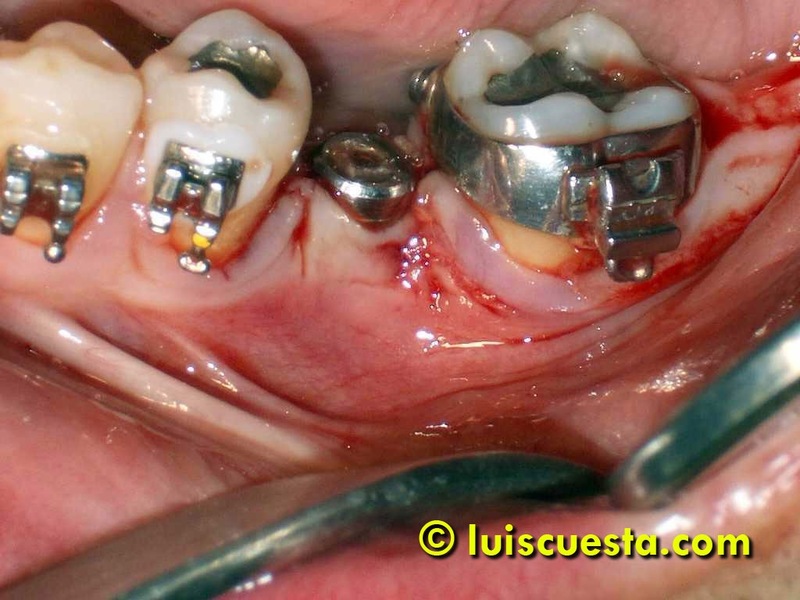 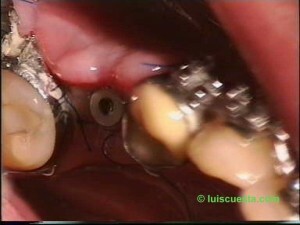 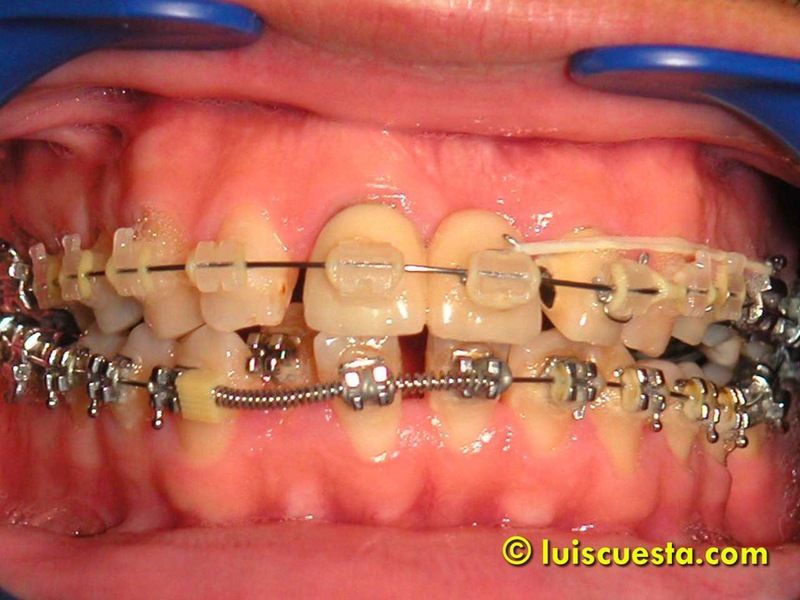 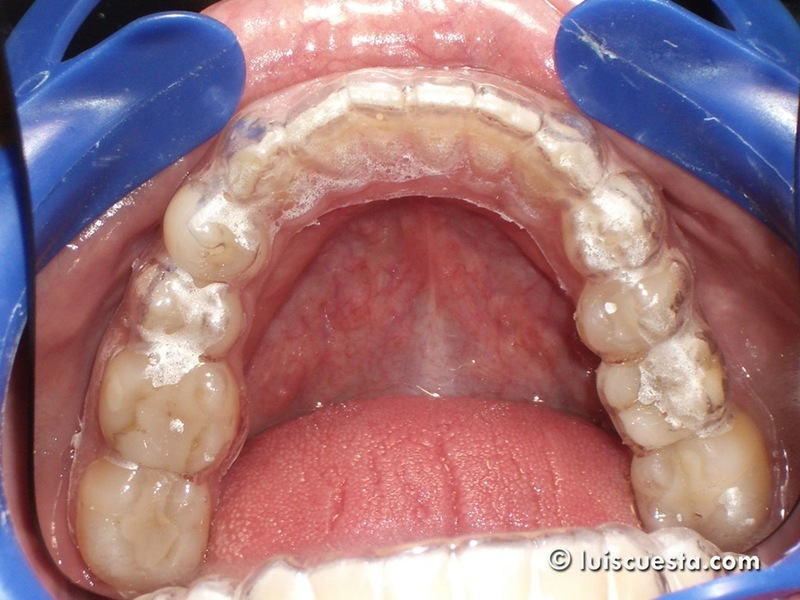 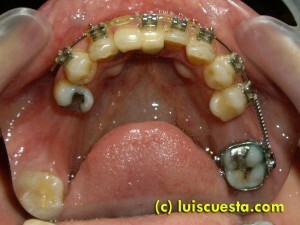 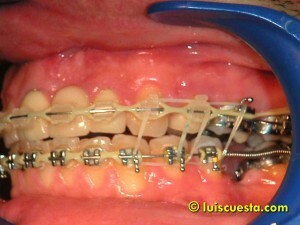 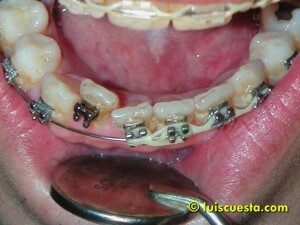 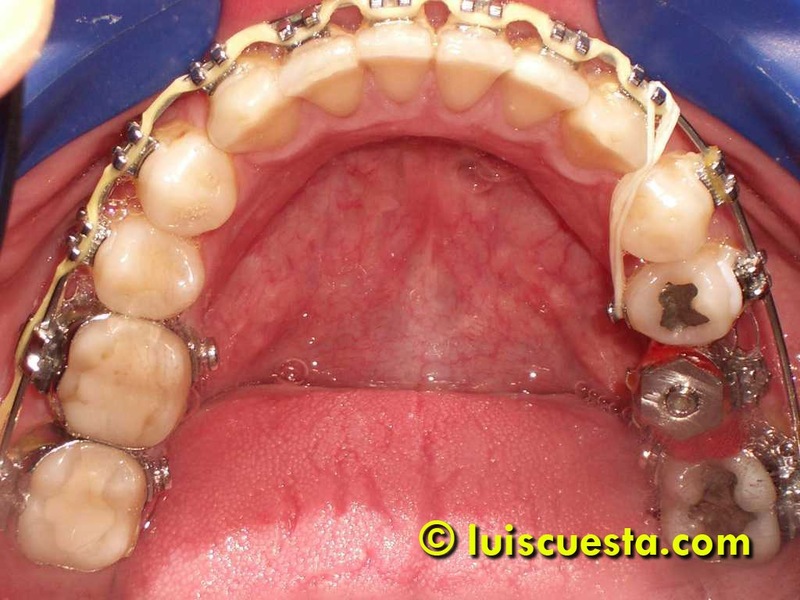 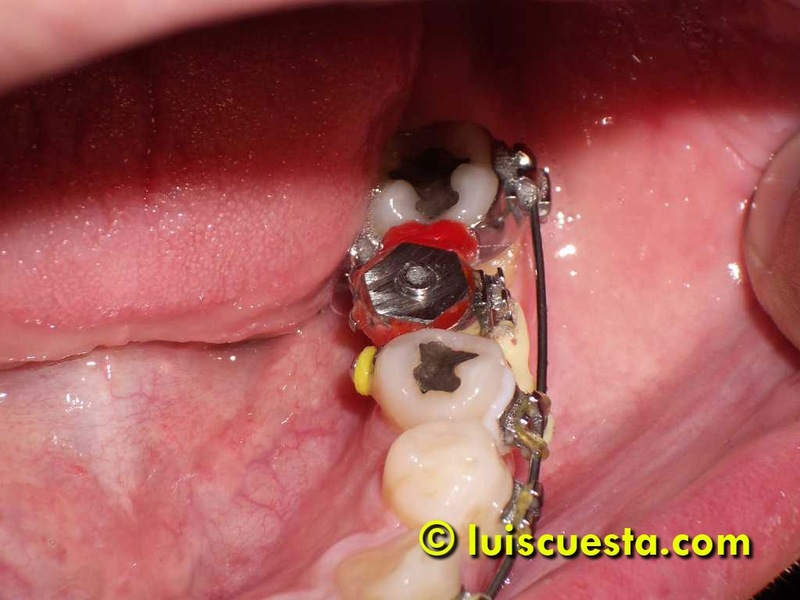 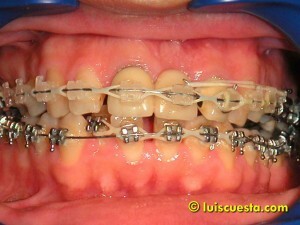 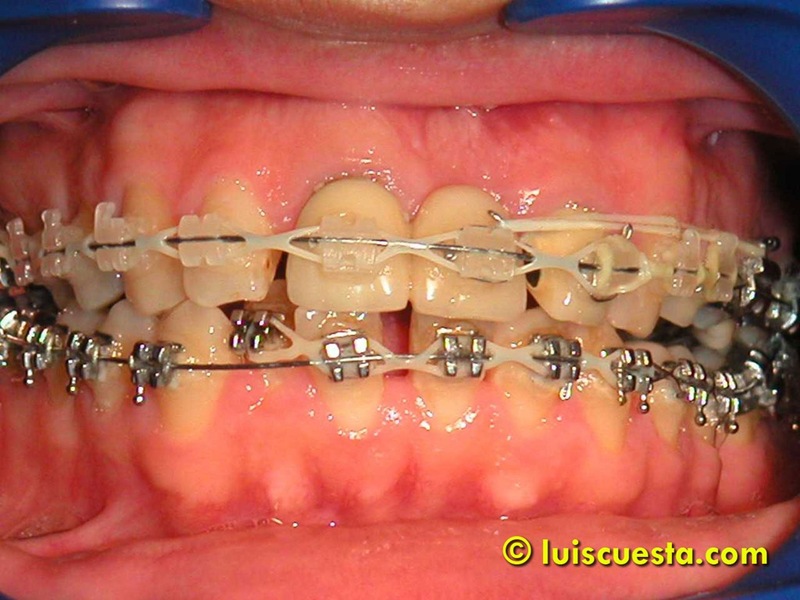 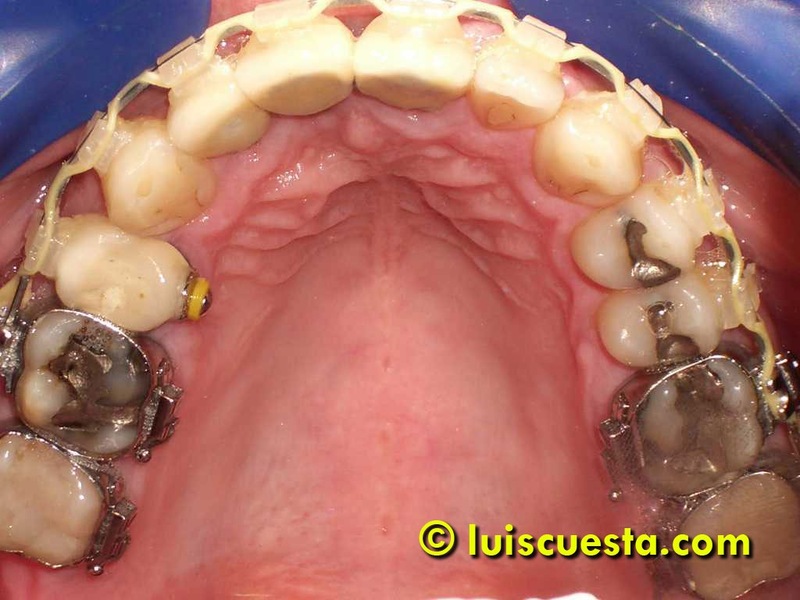 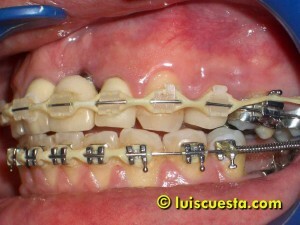 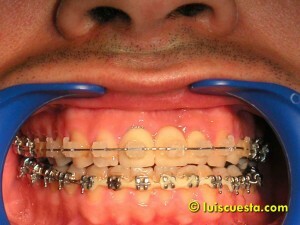 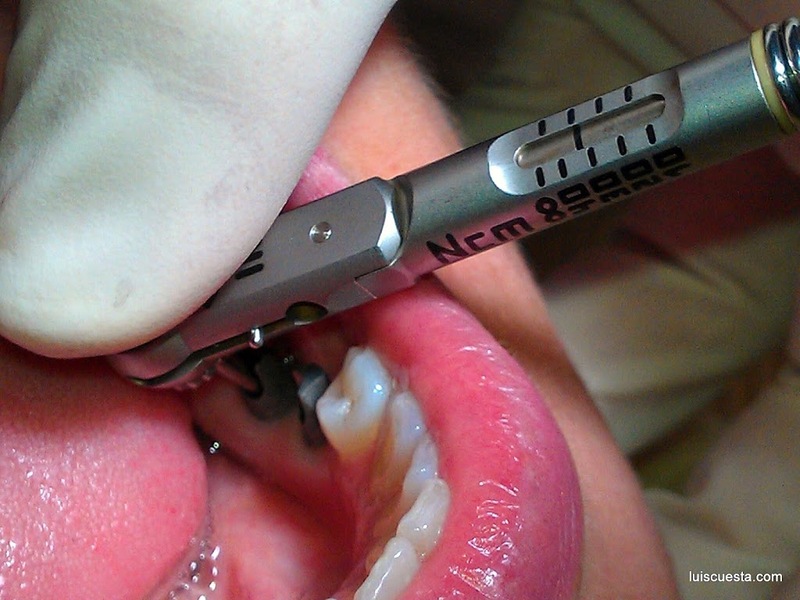 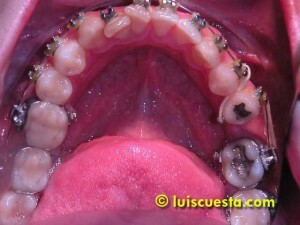 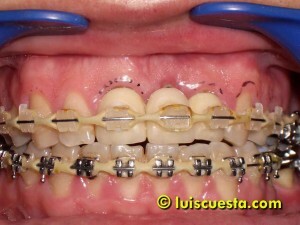 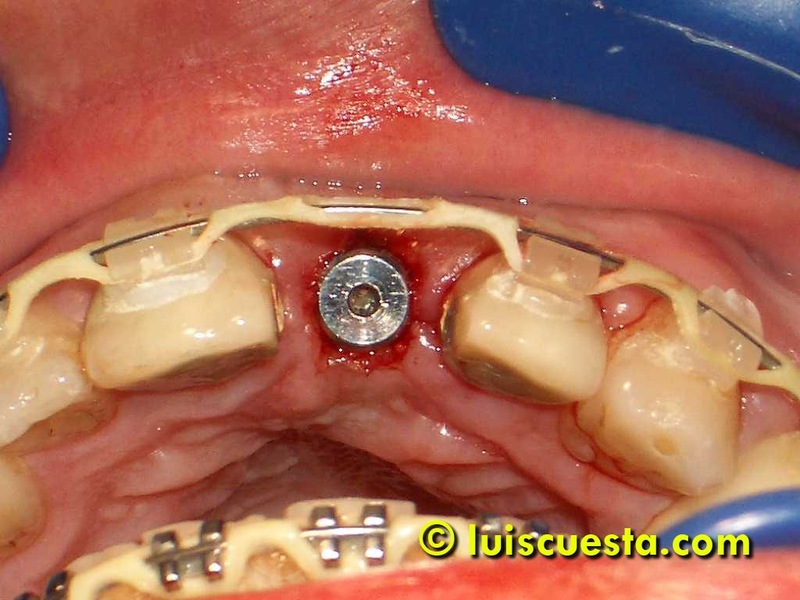 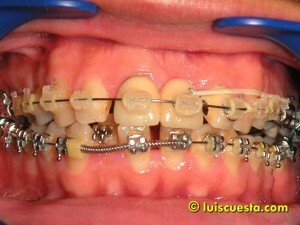 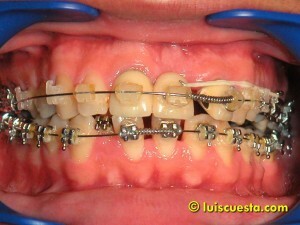 The final corrections are accomplished with elastics from either the labial bracket or the lingual button. 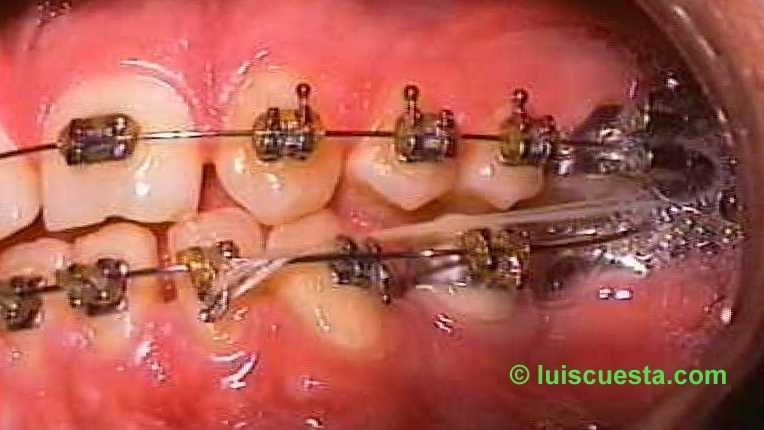 When everything is in its final place, I remove the braces, cut the 11&22 crowns, carve the 11,22&24 preparations and apply two retraction threads together with vase constrictor. I take a two-step silicone impression. 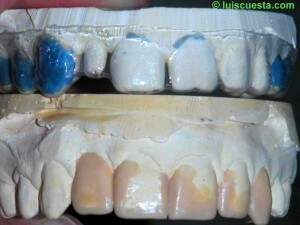 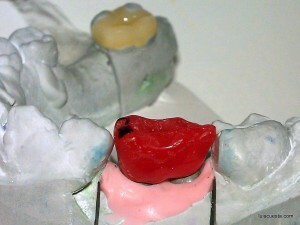 Temporary resin crowns are used during color and shape trials. 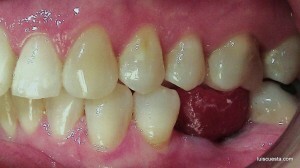 Several were done until a good esthetic result was accomplished.Notice the compressed, isquemic gum on 21 right after placement. The crowns are made of Procera ceramic. Placement of the 36 crown is achieved in several days. 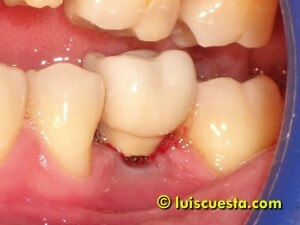 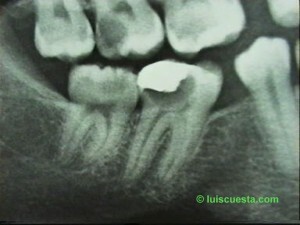 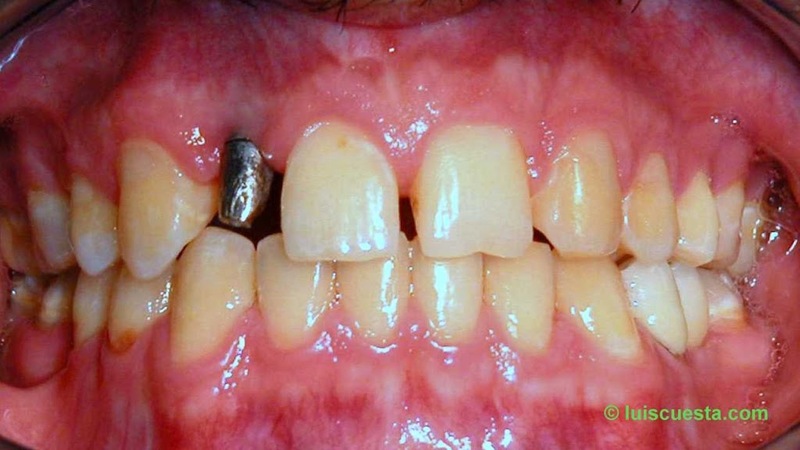 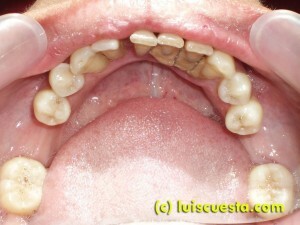 This was due to the unavoidable tendency of the molar and premolar go close the space. 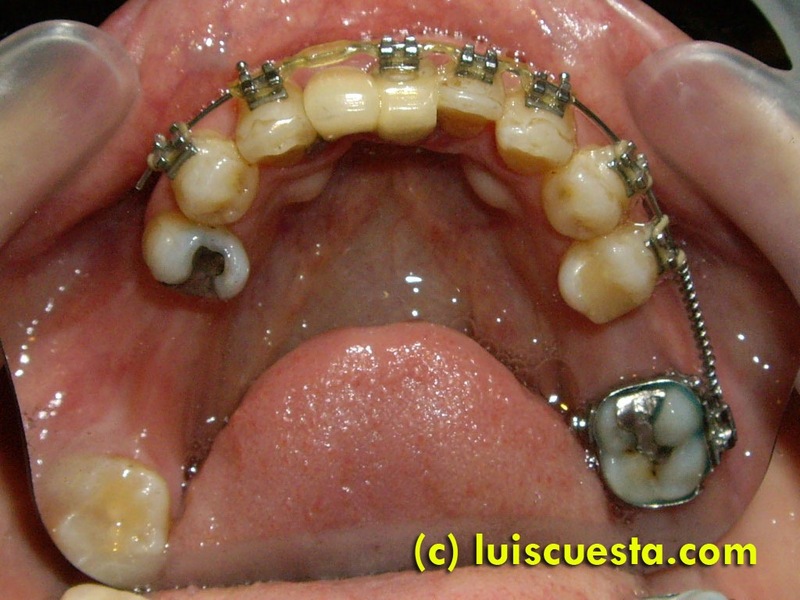 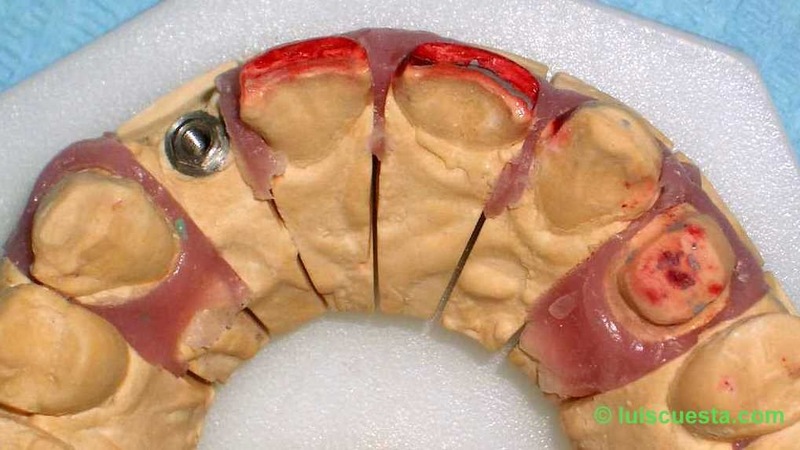 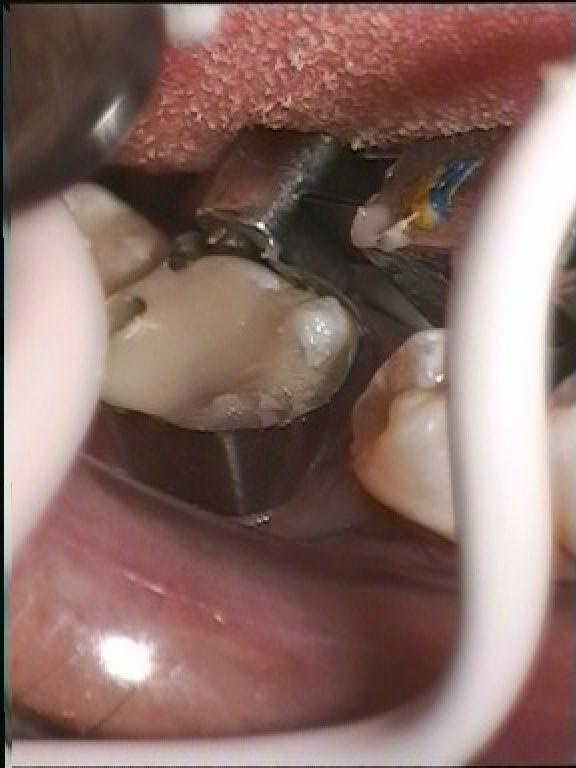 Despite the use of the band-resin maintainer, a small width difference was enough not to allow the crown to fit in place at the first moment. 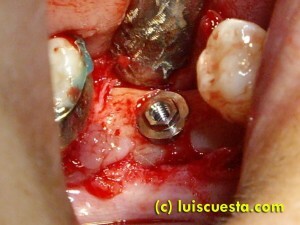 The crown was screwed in, little by little, in the following days. 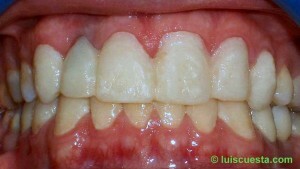 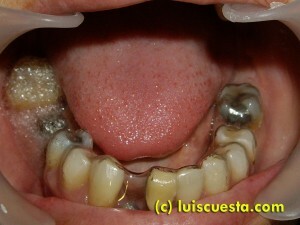 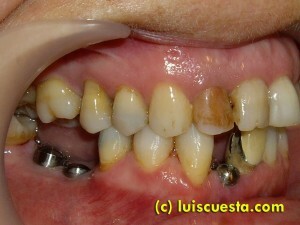 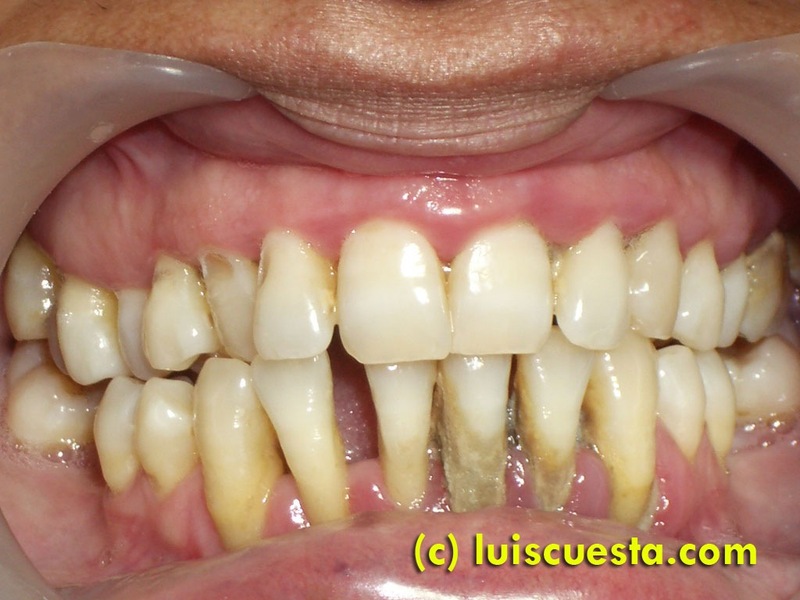 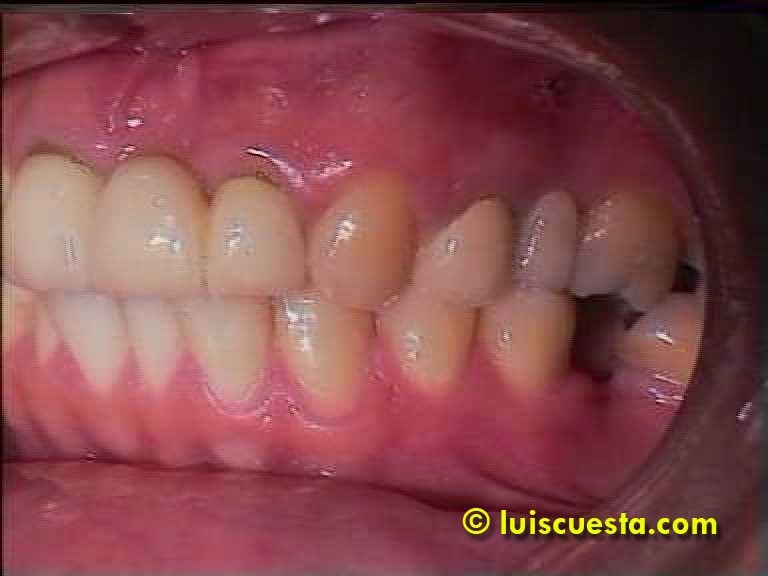 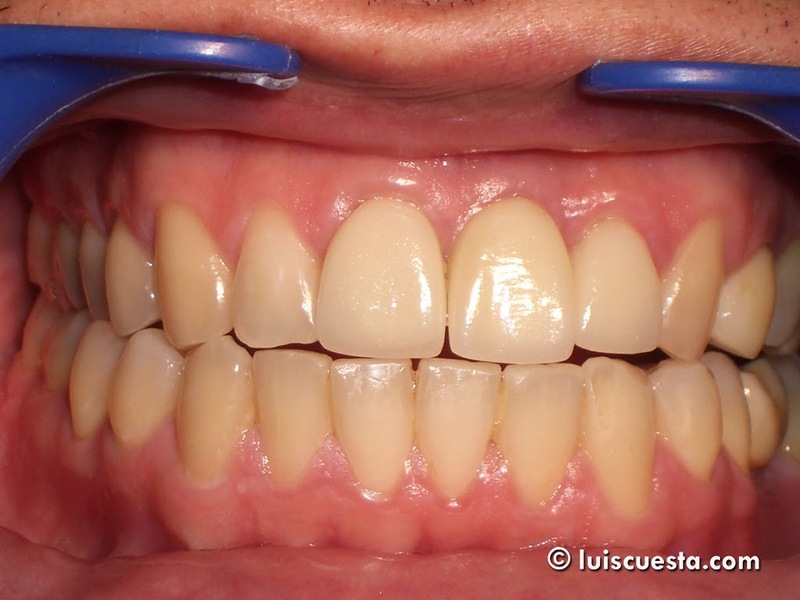 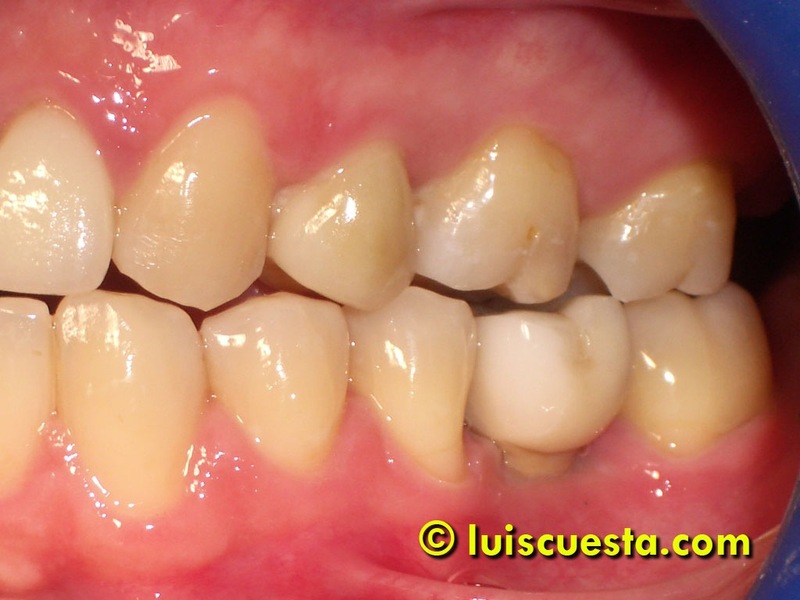 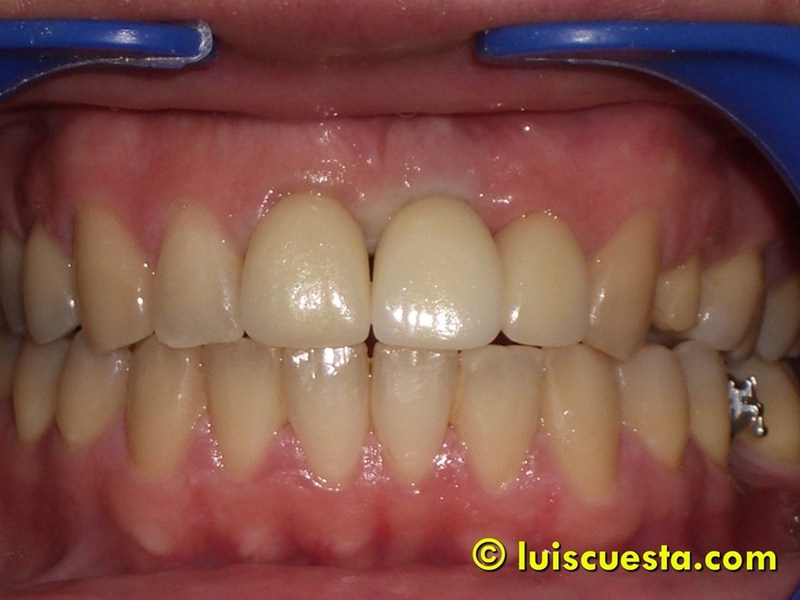 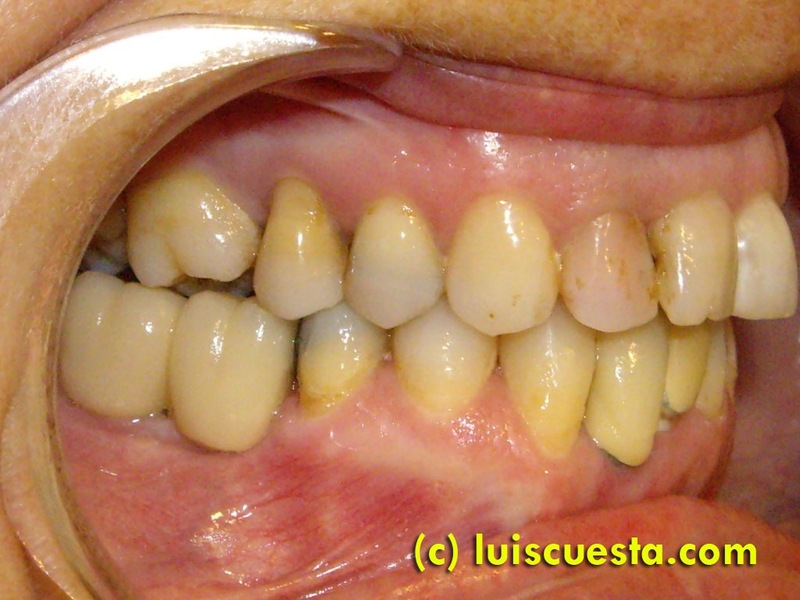 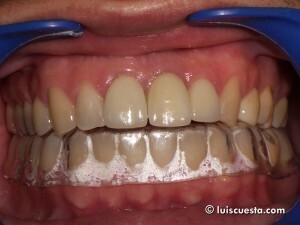 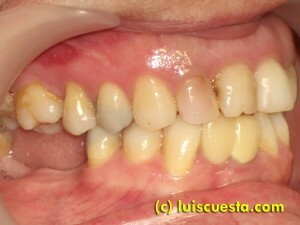 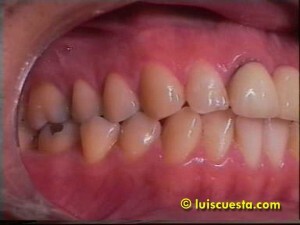 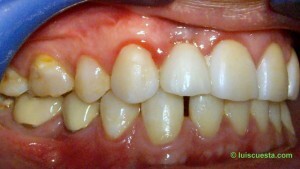 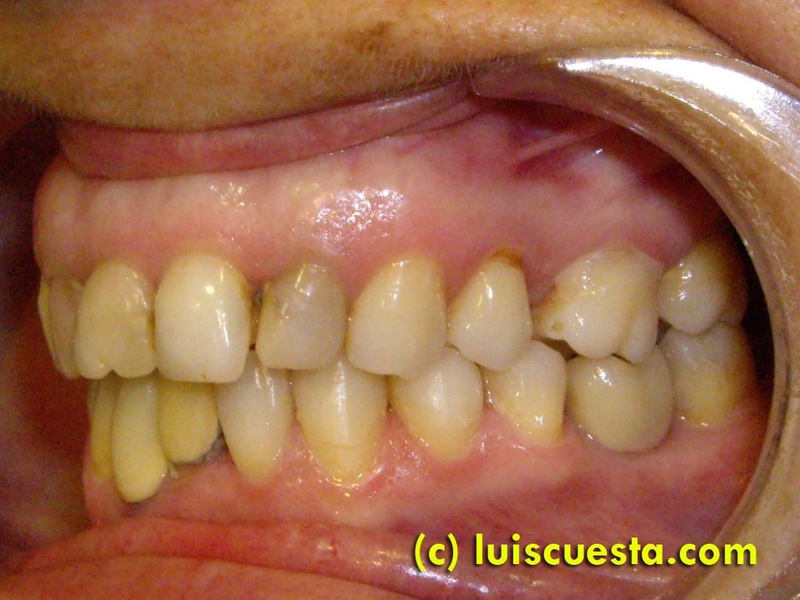 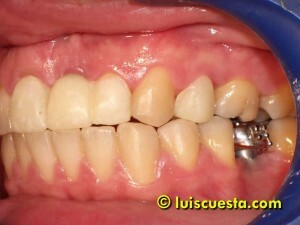 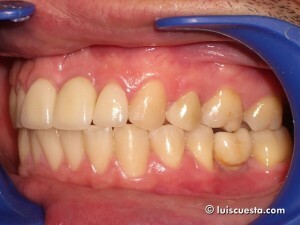 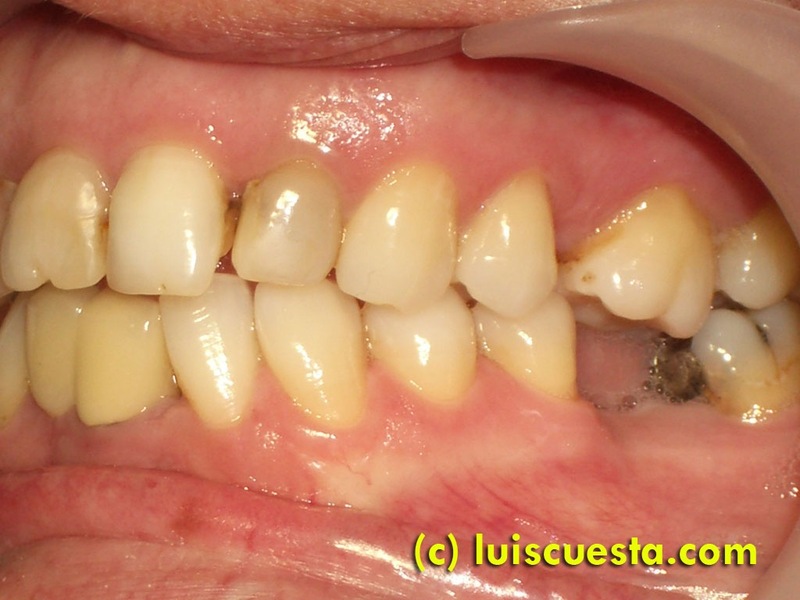 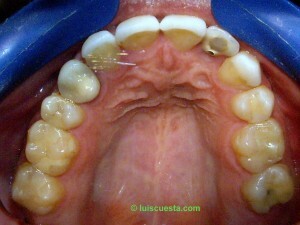 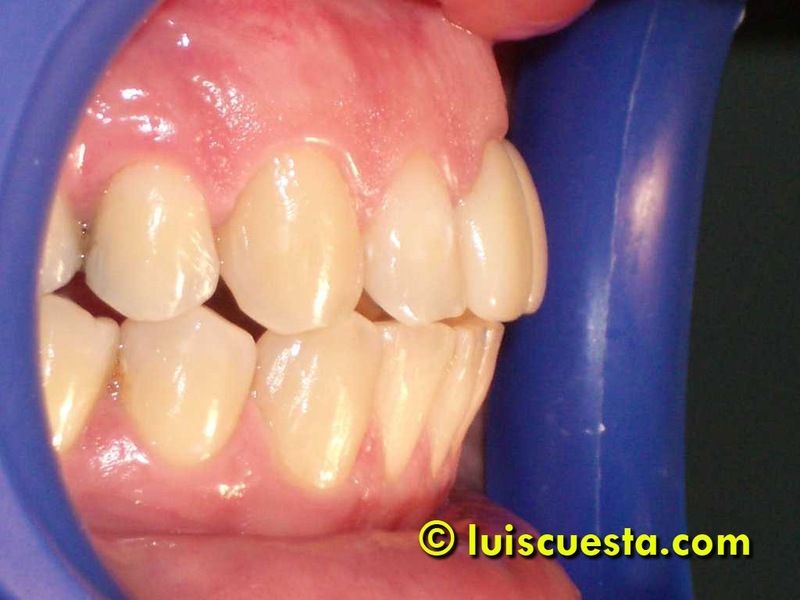 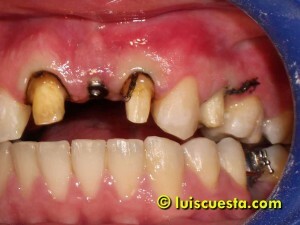 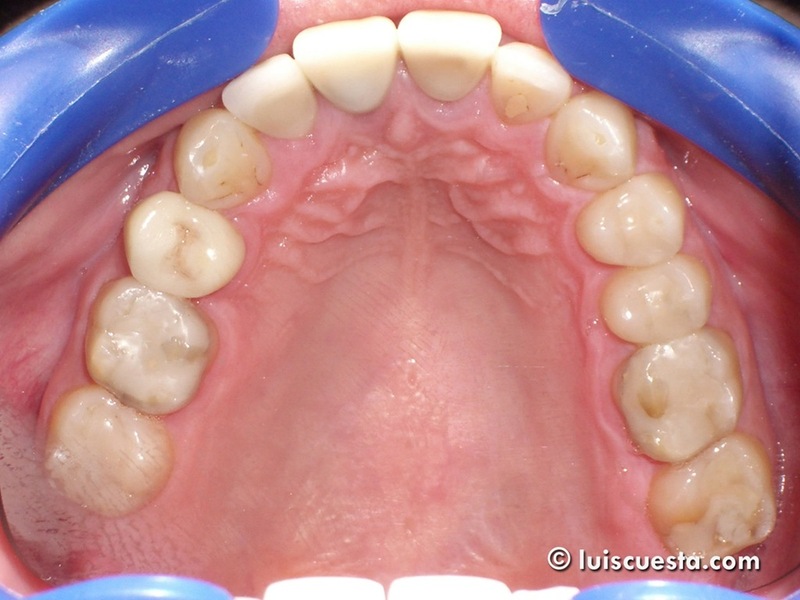 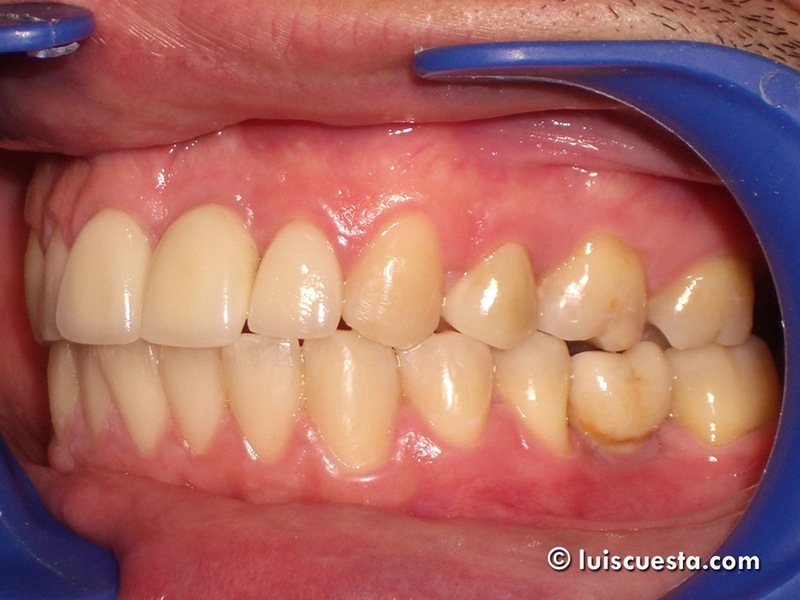 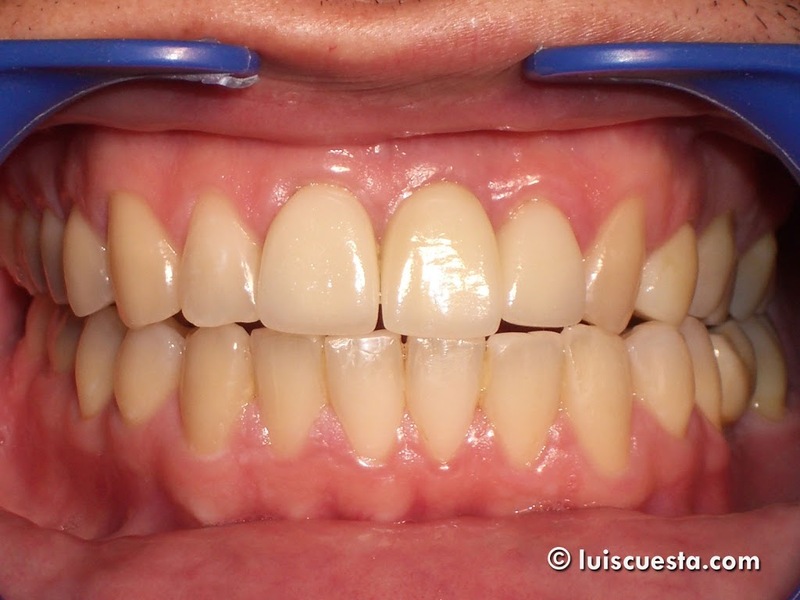 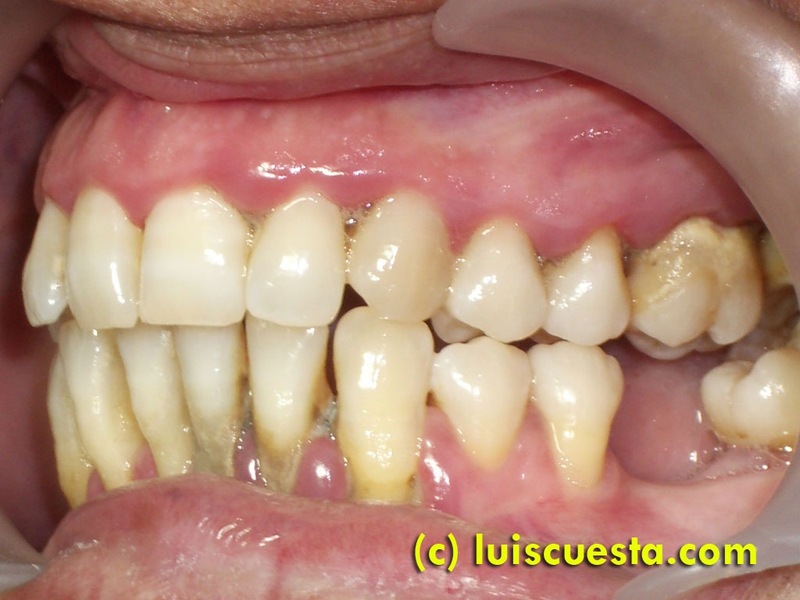 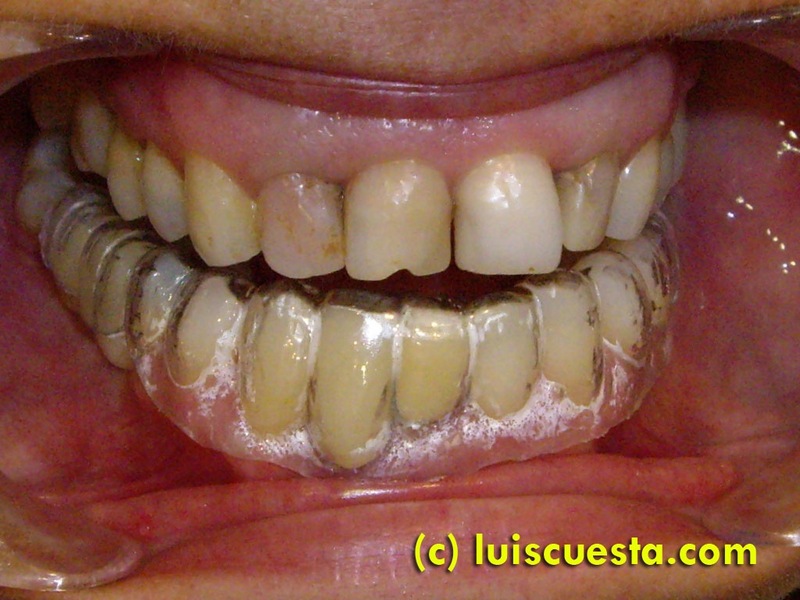 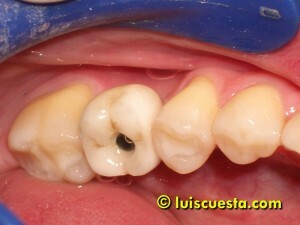 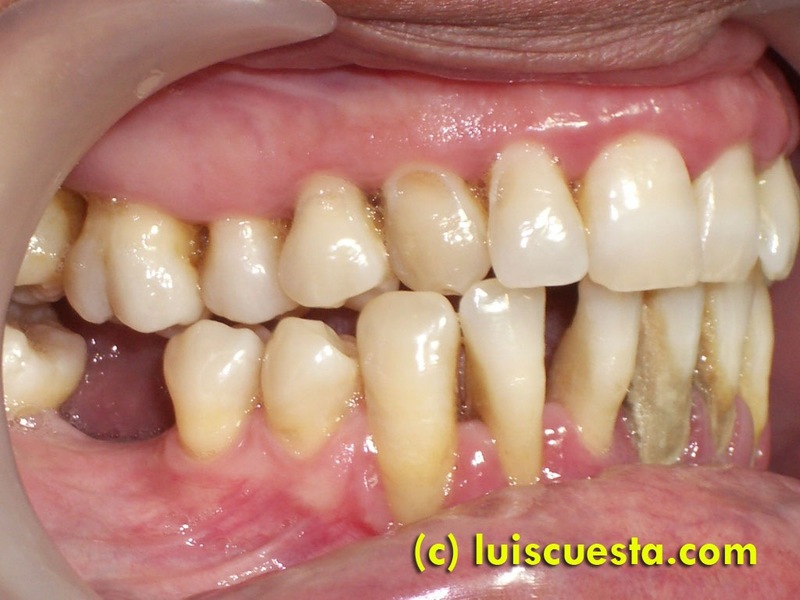 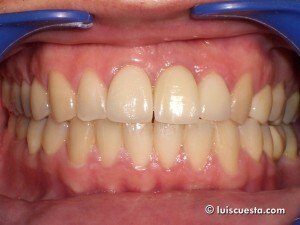 I substituted the old amalgam restorations by composites and placed a .060″ clear retainer on the lower arch. Notice the slight rotation of 41 during this phase. 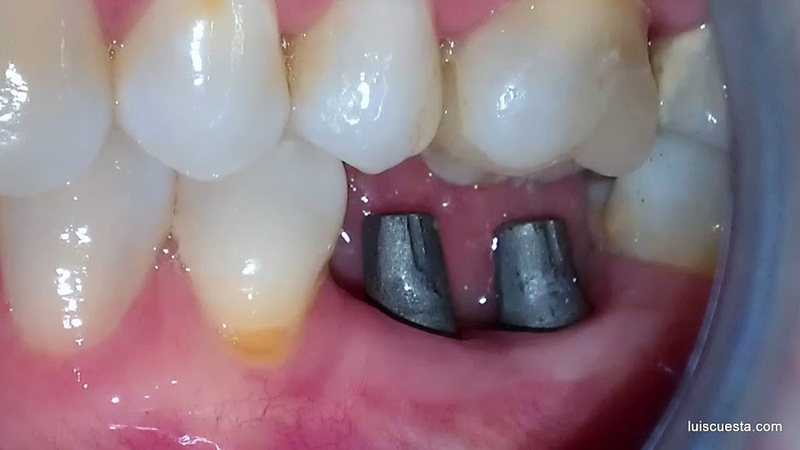 Upper retention was not needed. 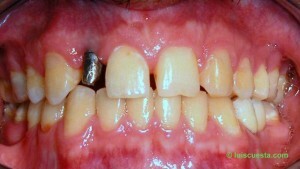 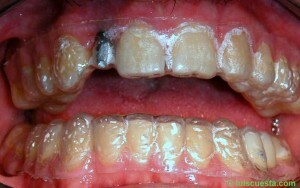 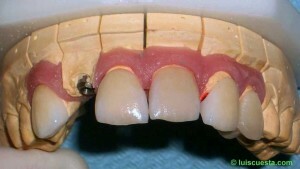 The implant on 21 may have acted as a retainer. 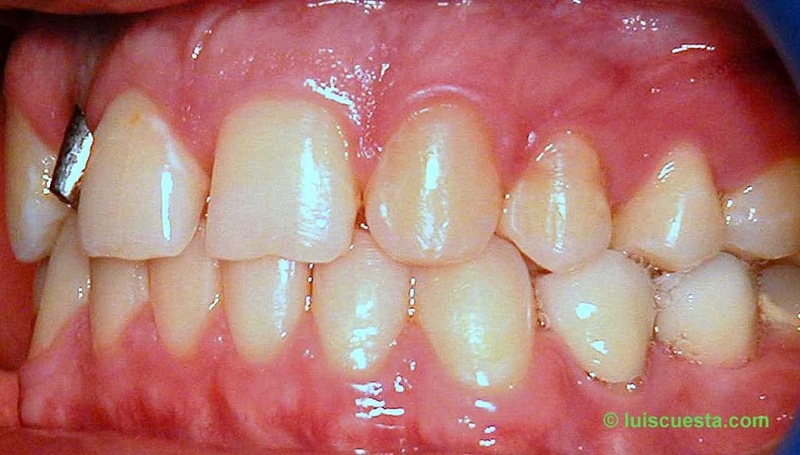 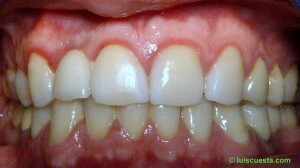 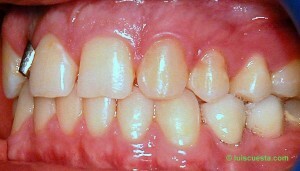 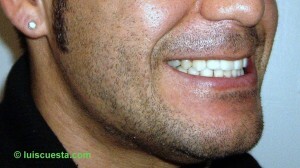 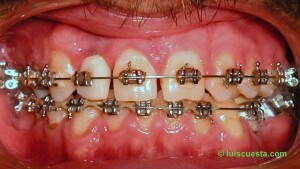 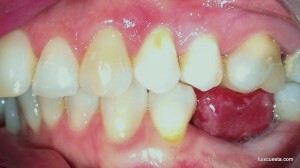 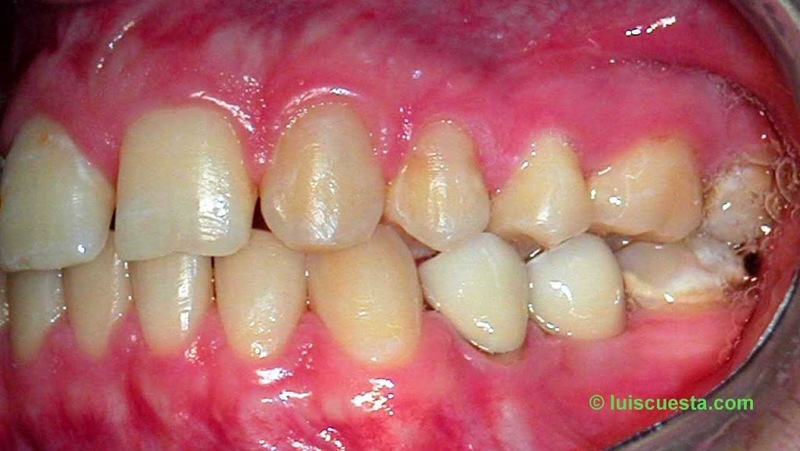 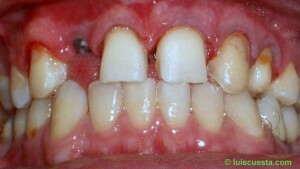 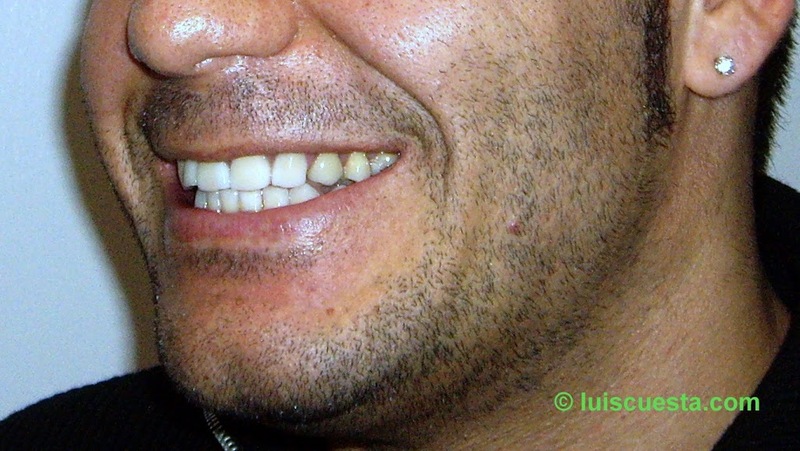 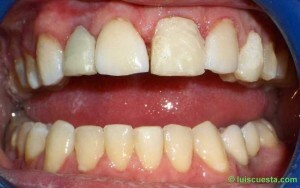 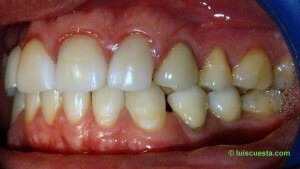 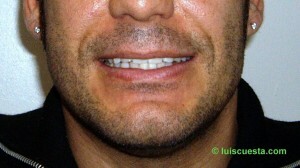 No motion was observed before or after this phase on the upper teeth. 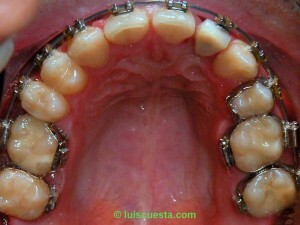 Before, intermediate and final stages of the front crowns. 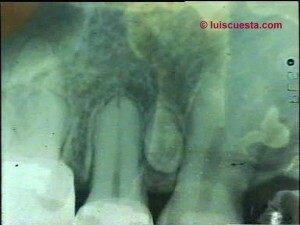 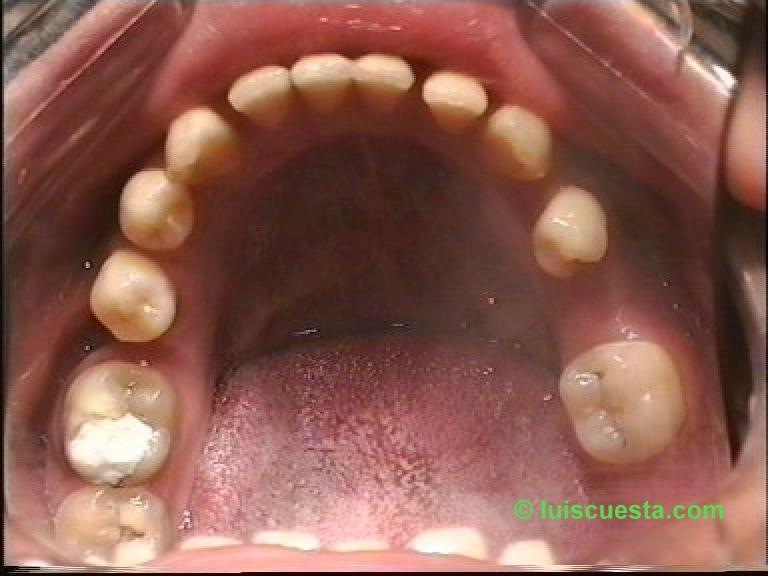 Final result on maximum intercuspidation.